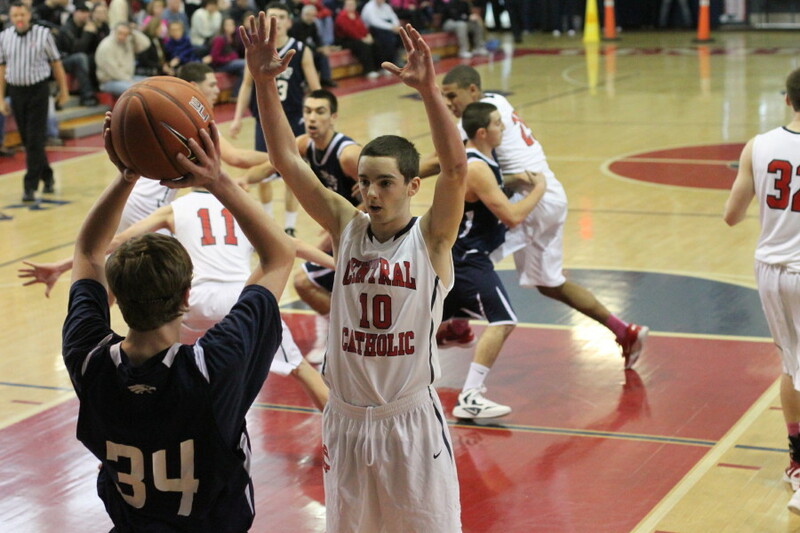 Rory Connolly beating out a bunt in the first inning. 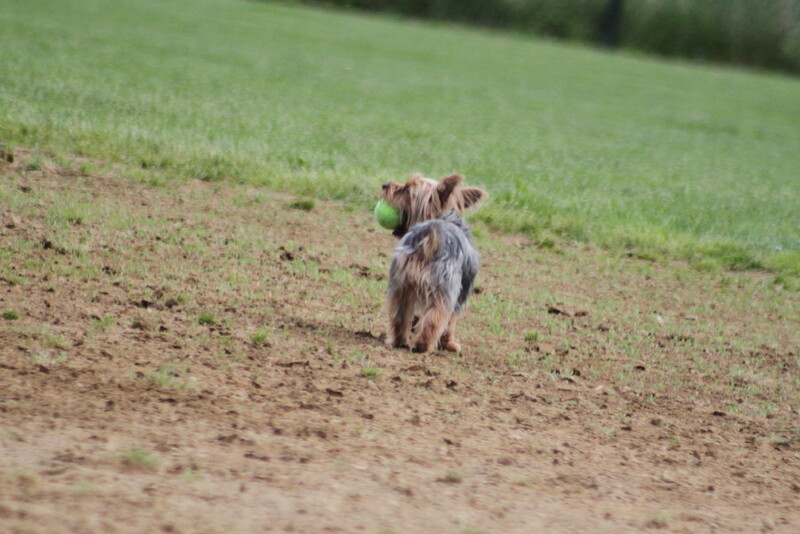 She would later score the first Winchester run on an Emma Morton double. 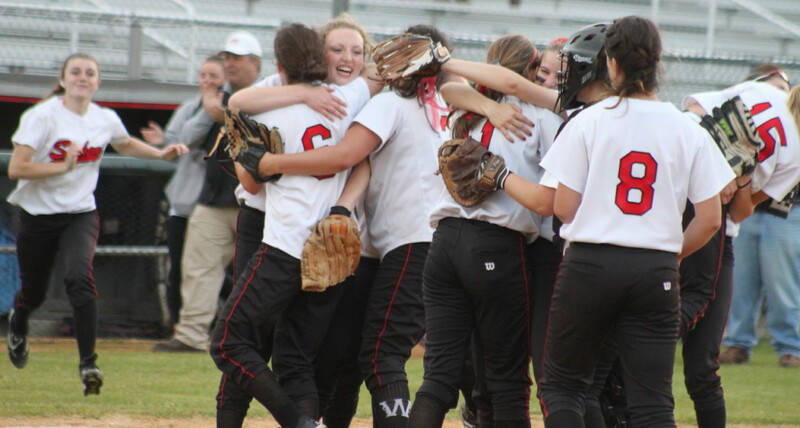 (Lowell) The Winchester Sachems added seven more shutout innings to their 2012 post-season run as they defeated Newburyport, 2-0, on overcast Thursday night at Martin Field in the Division 2 North semi-finals. 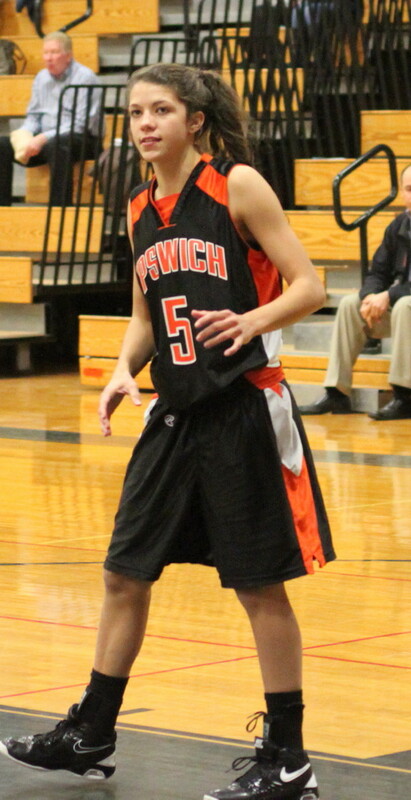 Winchester (16-5) will get either Dracut or Danvers on Sunday afternoon at Martin Field for the D2 North title. 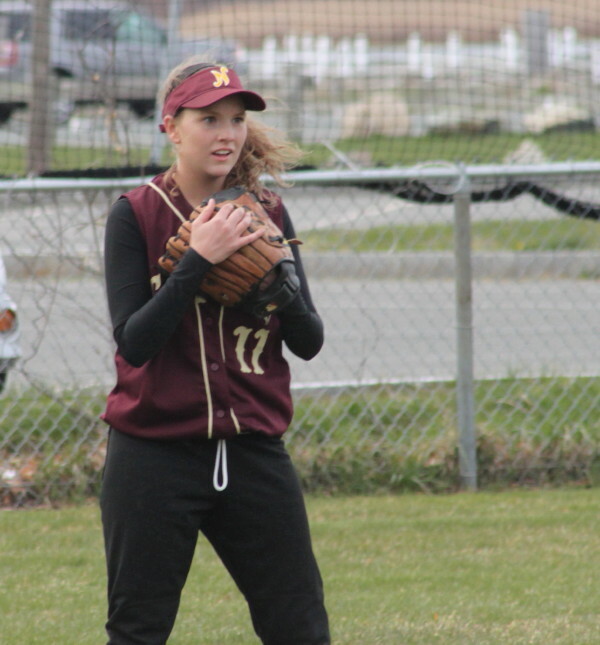 The Sachems have shut out all three opponents in the D2 tournament and it was easy to see during four hitless innings that sophomore pitcher Rachel Smith was part of the reason. 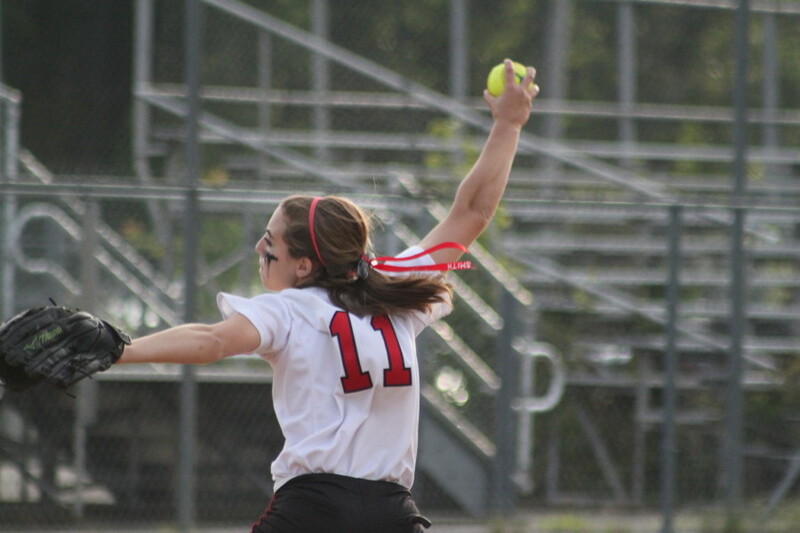 Rachel recorded five of her six strikeouts in the first four innings. 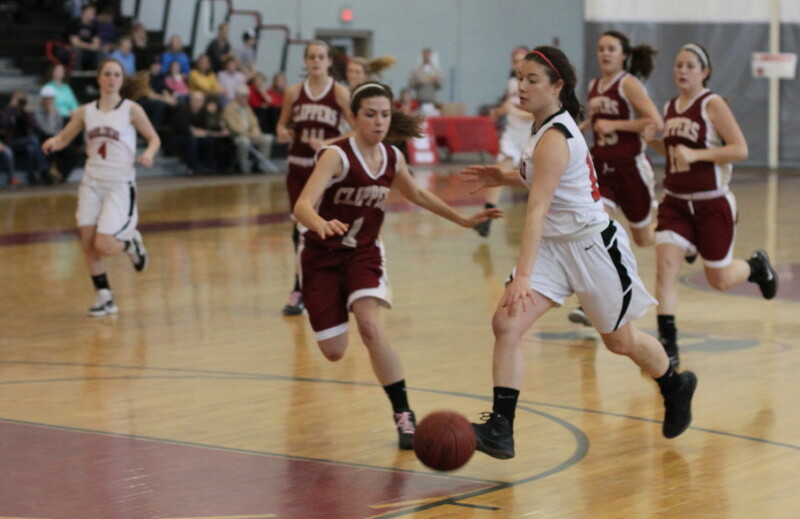 Winchester jumped off to a 1-0 lead in the first. Rory Connolly led off with a bunt single and reached third after a sacrifice bunt (Anne DeRosa) and a fielder’s choice (Rachel Smith). 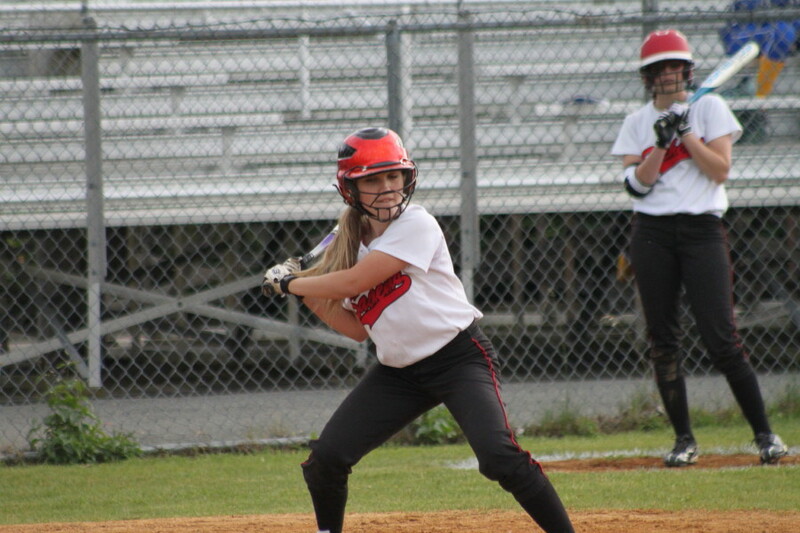 Junior Emma Morton ripped a double to right center scoring Rory. 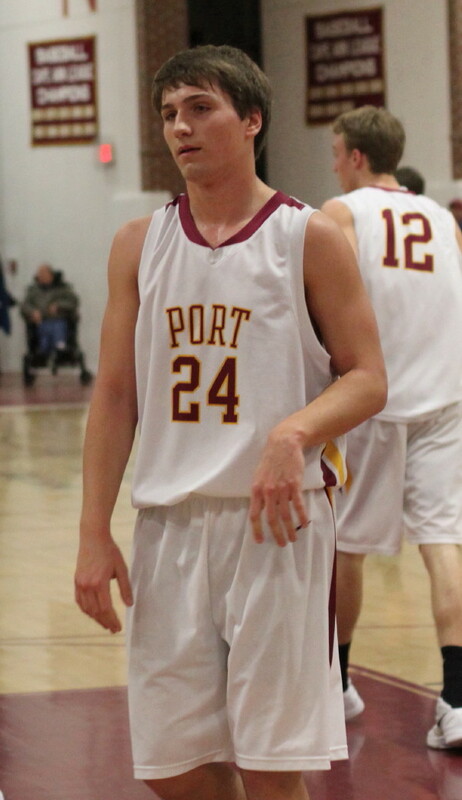 Newburyport (13-10) from the Cape Ann League came to life in the final three innings. All four of their hits came during that segment and they stranded six runners. 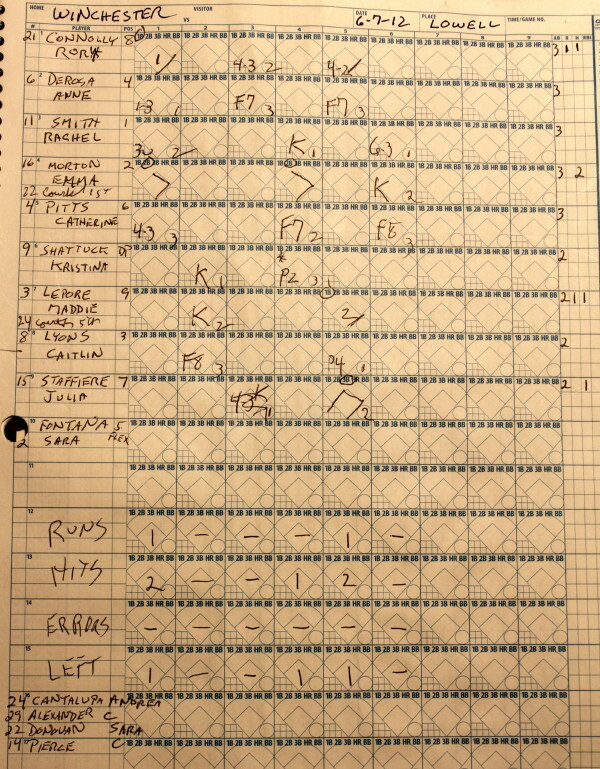 During the fifth inning Winchester added a second run. 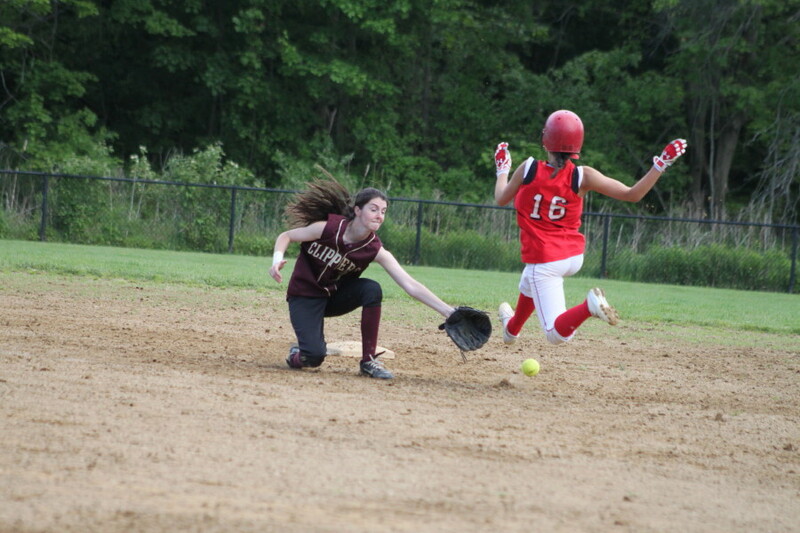 Maddie Lepore reached on a flair behind first with no outs. 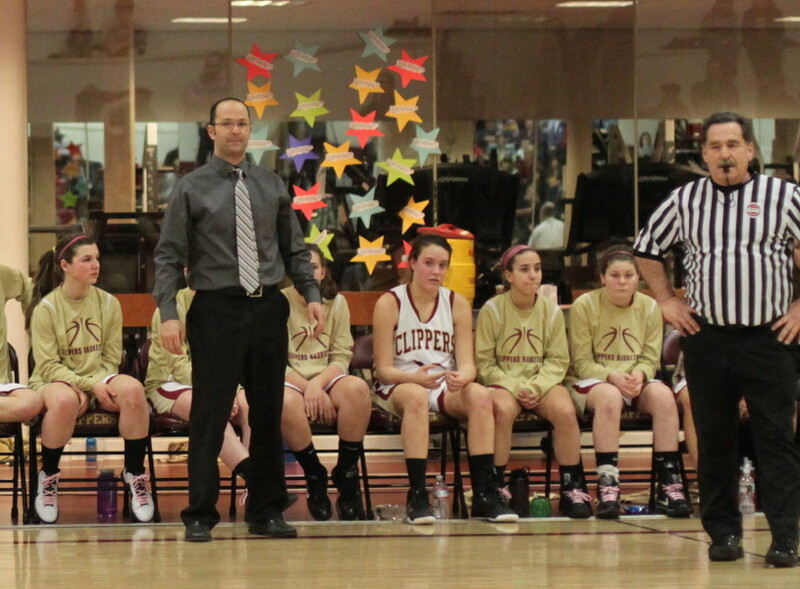 Andrea Cantalupa came on as a courtesy runner for Maddie. Julia Staffiere delivered Andrea with a hot shot over the third base bag that rolled all the way to the left field corner for a triple. 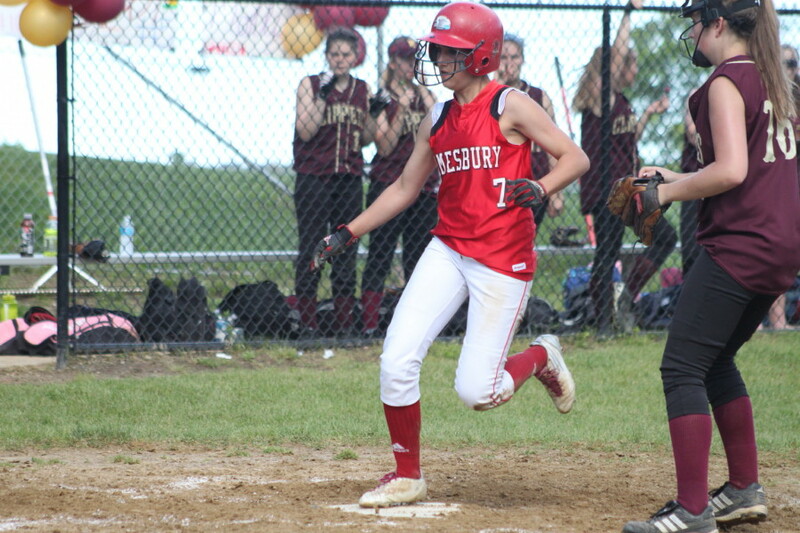 Julia’s RBI gave the #7 seeded Sachems a 2-0 lead heading into the final two innings. That lead would be severely threatened by the Clippers in the final two frames. 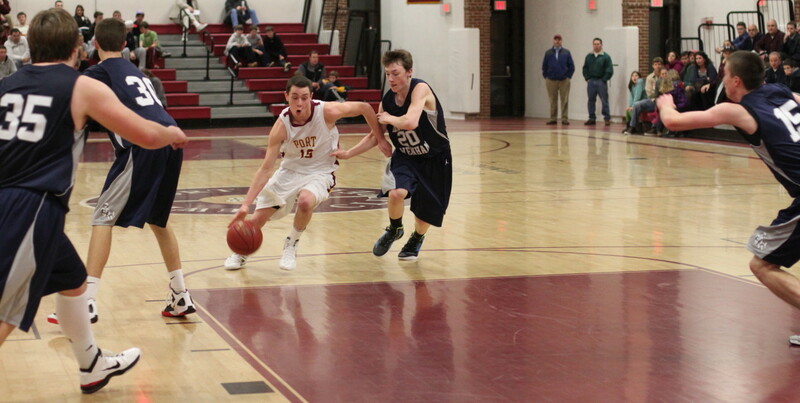 Newburyport (#14 seed) loaded the bases in the sixth. Singles by Kendra Dow and Lea Tomasz were followed by Rachel Smith’s bobble of a Carley Siemasko grounder with two outs. Rachel recovered from the error to retire Beth Castantini on a routine fly ball to center to end the bases-loaded threat. 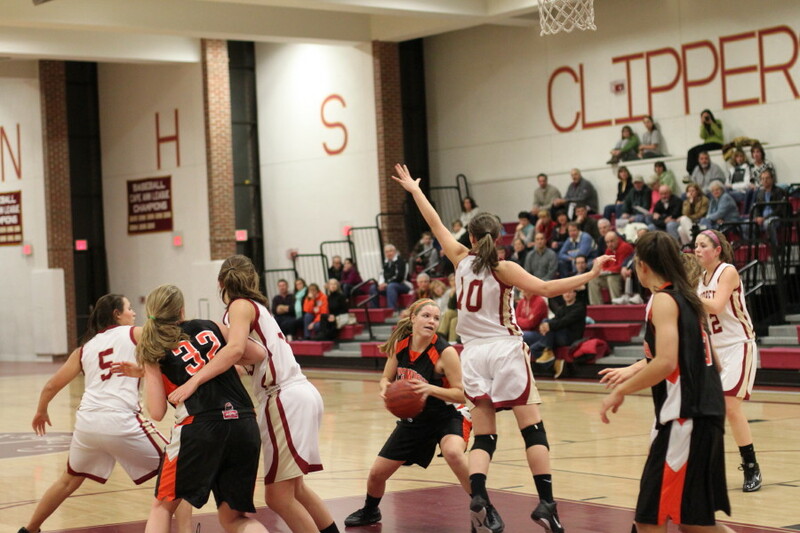 The Clippers took another run at the Sachems in the seventh. 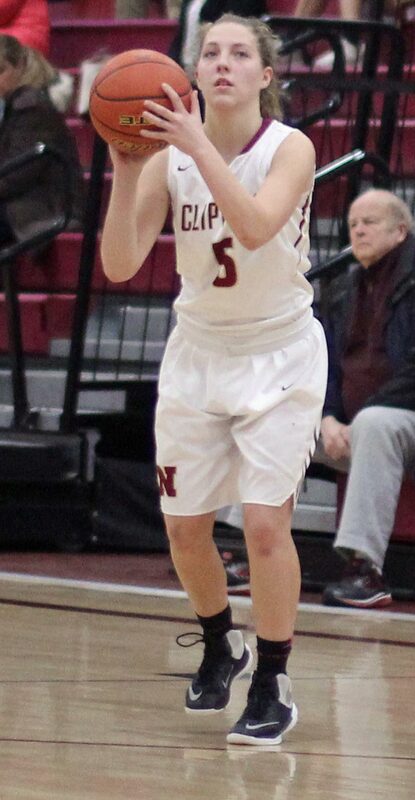 Newburyport had two loud outs (Maddy Stanton liner to center & Casey Barlow’s shot that shortstop Catherine Pitts speared) as well as a walk (Vicky Allman) and a single (Jackie Krusemark). 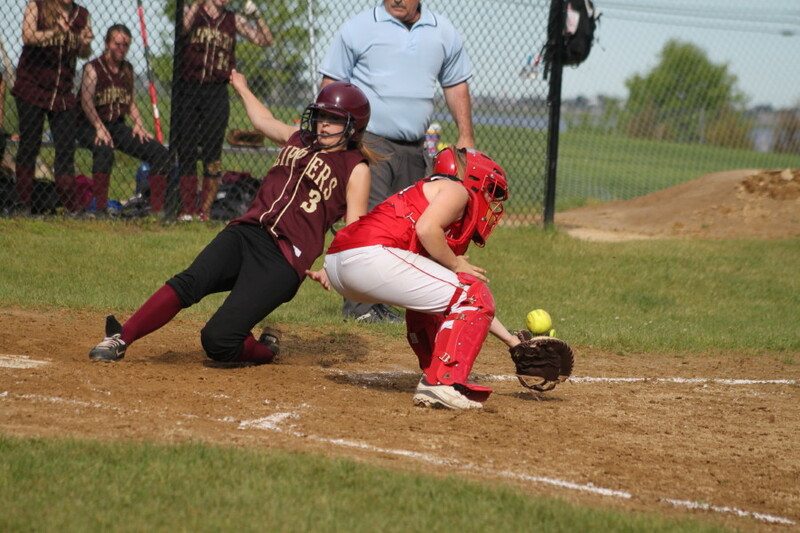 But again Winchester escaped being scored on as Kendra Dow grounded out to second to end the game. 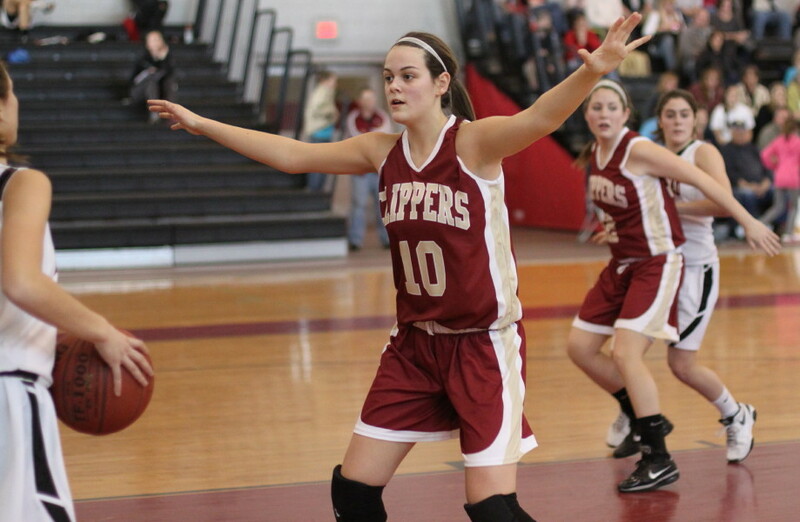 Beth Castantini had a strong outing in her final endeavor as a Newburyport Clipper allowing only five hits. 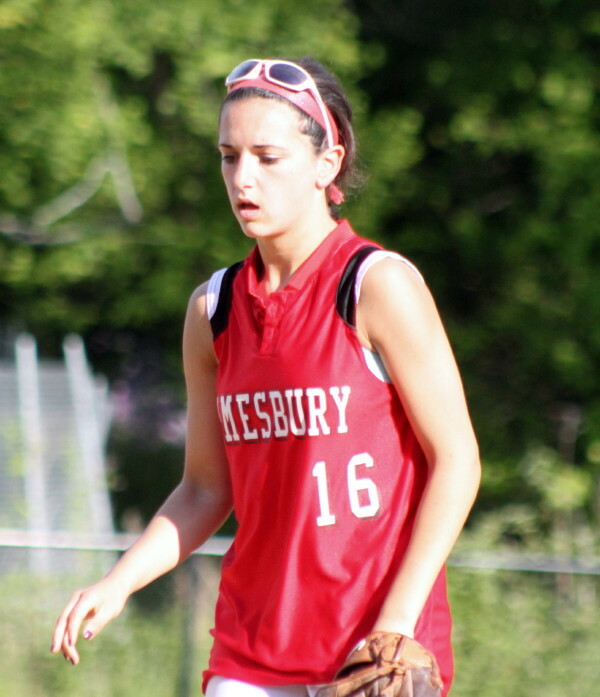 She also struck out five Sachems and walked no one. 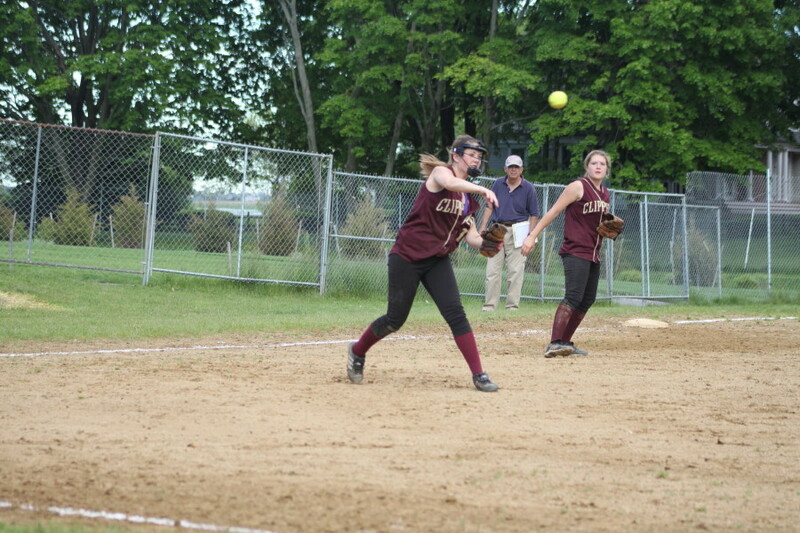 Catcher Emma Morton stroked two doubles and had several long-distance foul balls for the team from the Middlesex League. 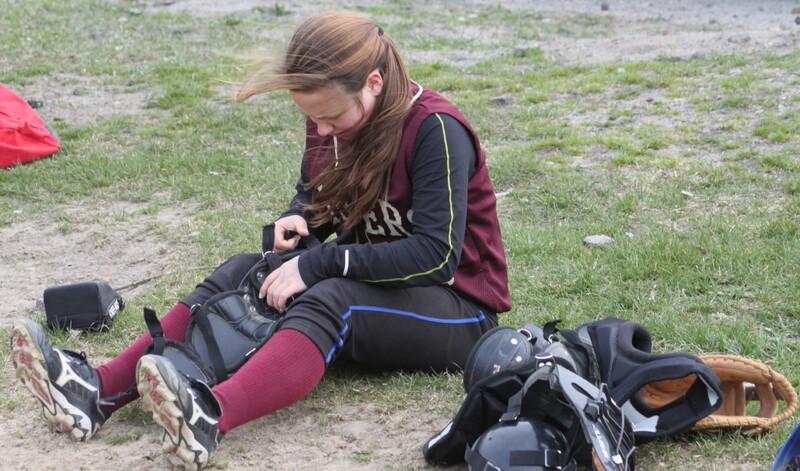 Kendra Dow hurt her leg lunging for first on the last out of the Clipper season. 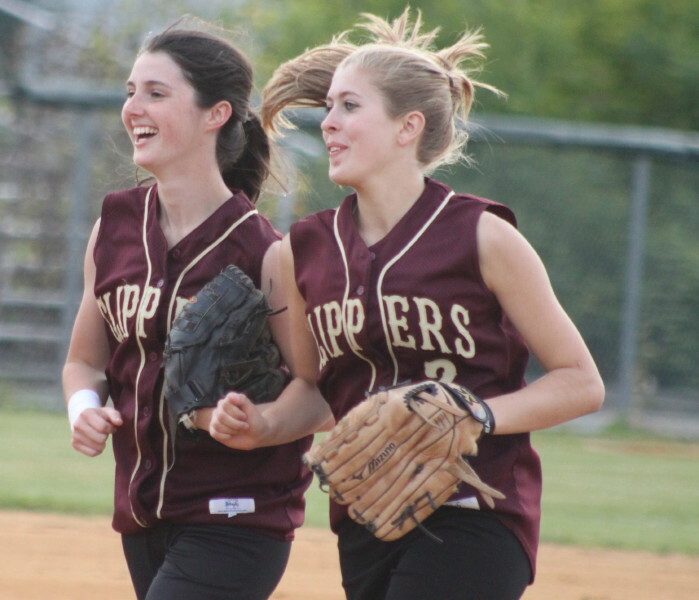 Clipper catcher Lauren Singer made a nice catch of a foul pop in the fourth inning. 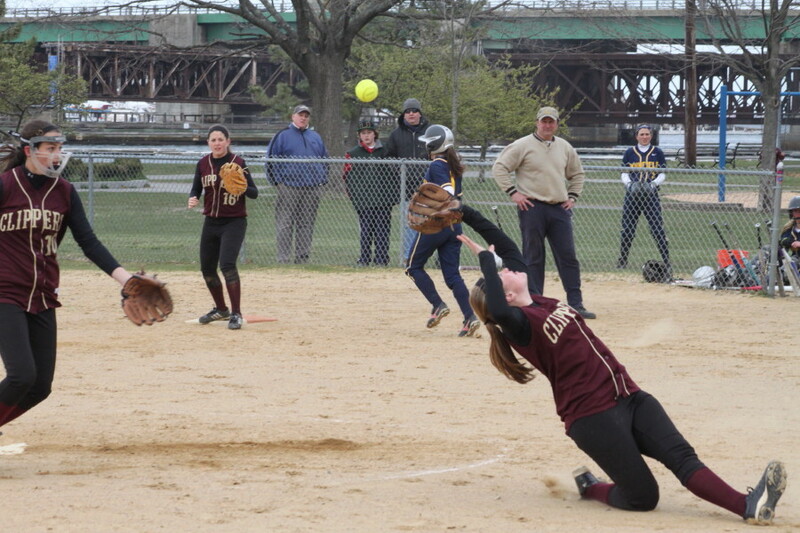 Maddie Lepore saves a run with this two-out catch in the third inning. 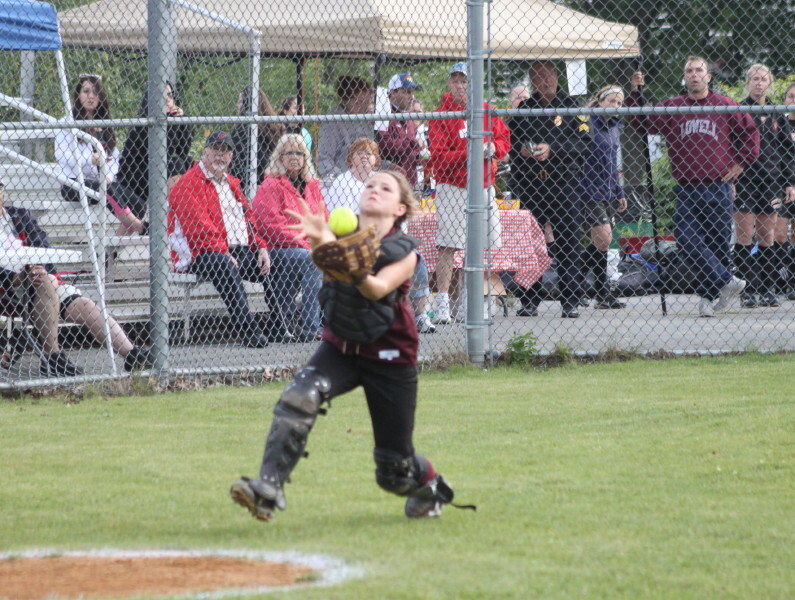 Maddie Lepore jumped to make a run-saving catch in right field in the third inning. 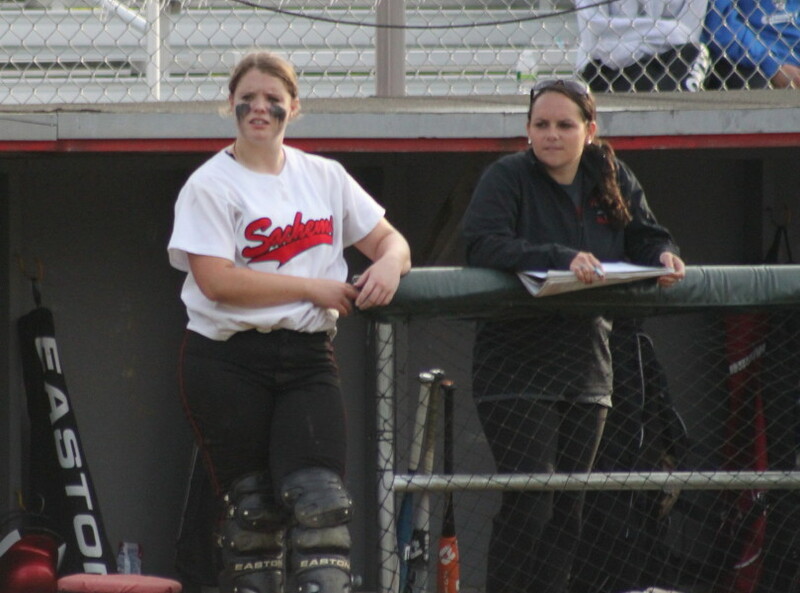 Casey Barlow was on second for the Clippers at the time after reaching on shortstop Catherine Pitts’ two-base throwing error. The weather? Downpour an hour before game time delayed the ending of the Mystic Valley/Matignon game. By the time the Clipper/Sachem game started the rain had stopped but threatening clouds had me wondering when the next deluge would drop. But thankfully, the rain stayed away. 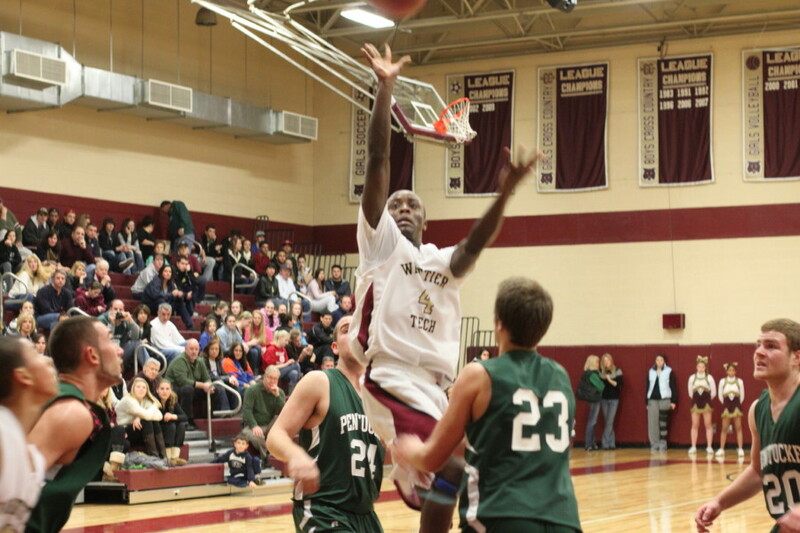 (Newburyport) The Newburyport Clippers (6-5) may have turned their season around with this one. 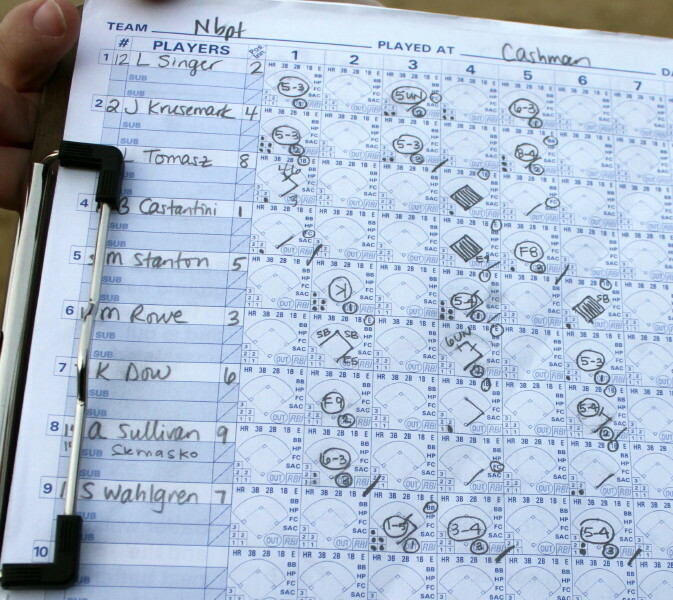 The Clippers beat a very good Rockport team, 3-2, at Cashman Park on Monday afternoon in Cape Ann League play. 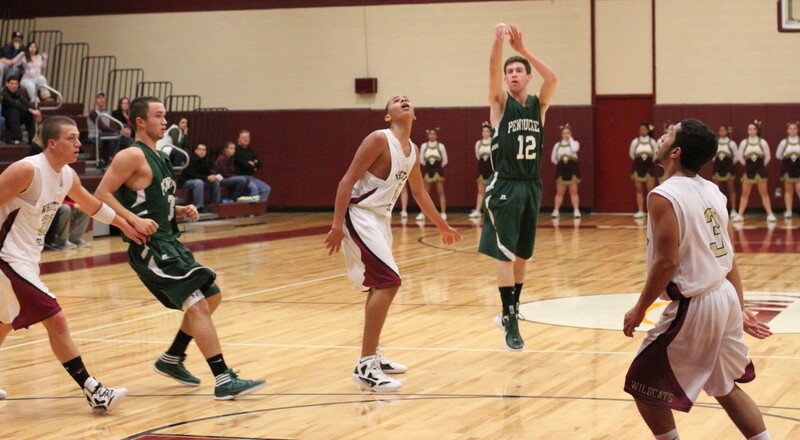 Rockport (9-2) has already won Division 3 of the Cape Ann League but they have now lost two of their last three. Newburyport, on the other hand, has been a disappointment. Last year the 17-5 Clippers found ways to win. This year the reverse has happened more times than expected. 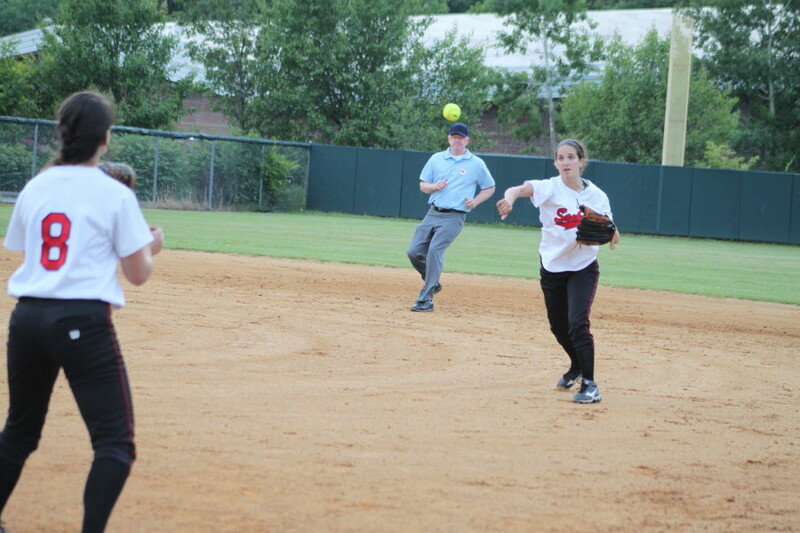 Mollie Rowe takes a throw to get Haley Lorden at first in the seventh. 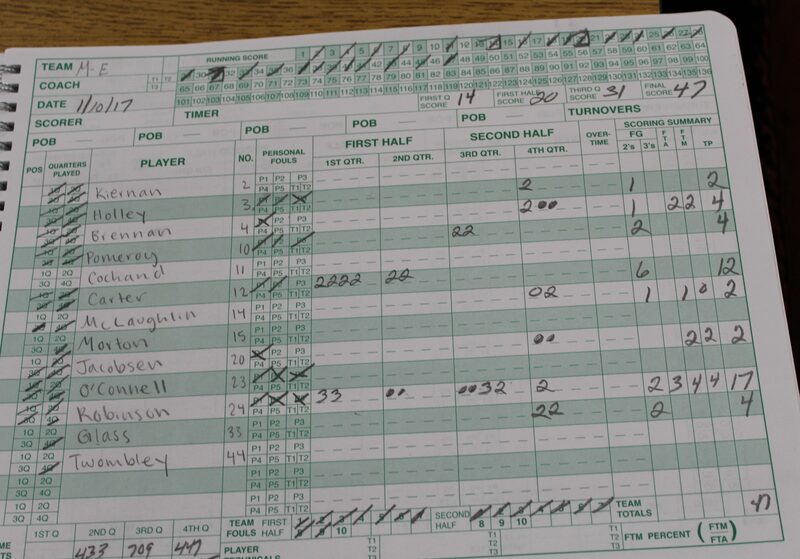 That’s why the win over Rockport may be the signal of better days ahead. 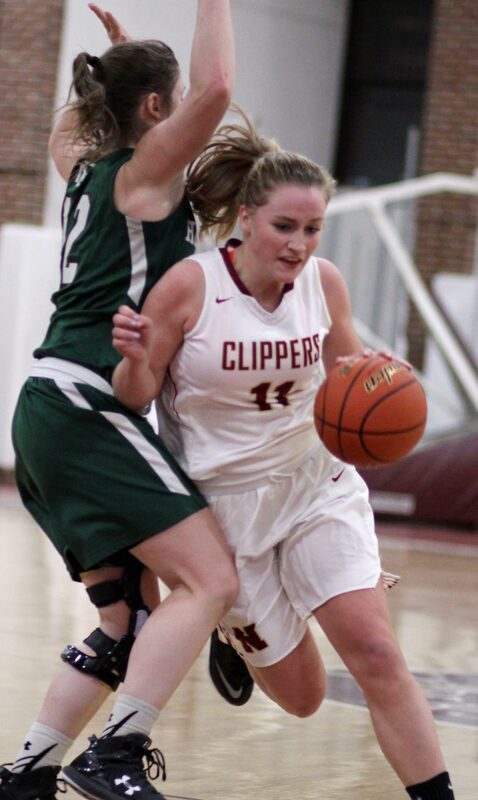 Here was a game in which pitching, hitting, and defense all clicked when needed and a game they could have been lost by Newburyport was won. 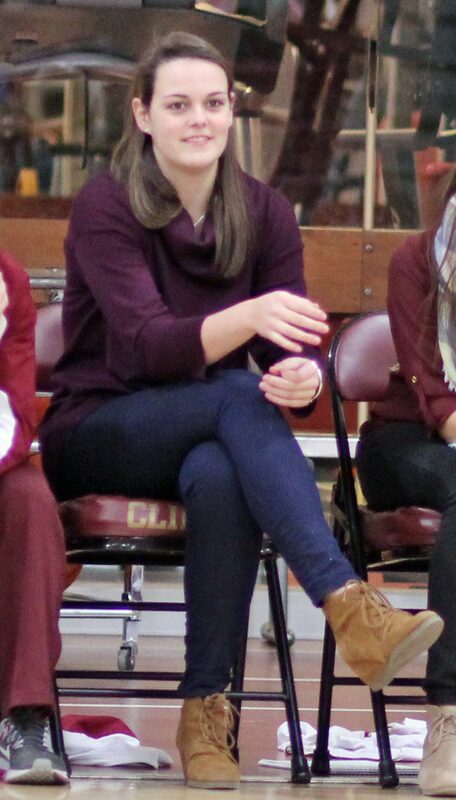 Winning pitcher Beth Castantini was several times within a pitch of walking in a run but it never happened. 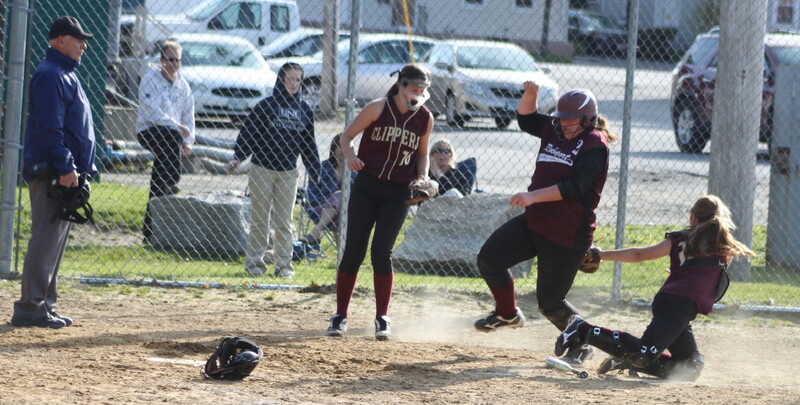 The Clipper hitters put hits together early to grab a two-run lead and later came up with the game winner after Rockport had rallied to tie the score. 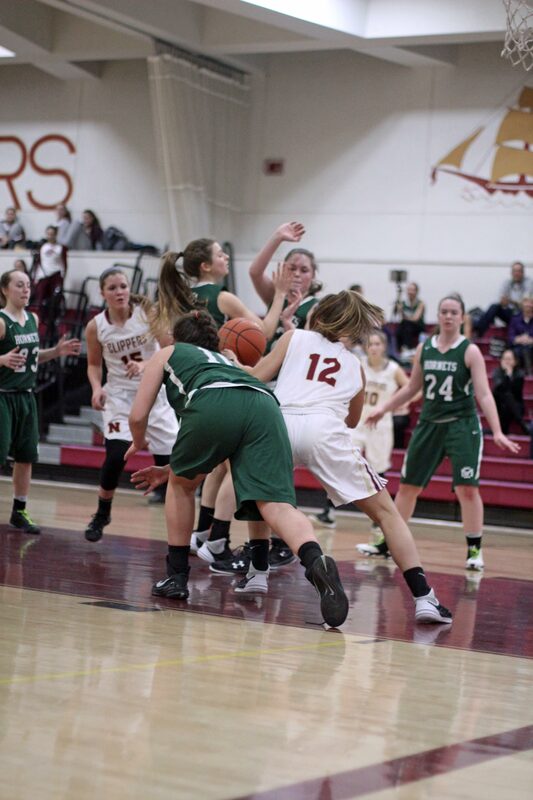 The Newburyport defense was also strong. There was a dropped popup but the team was mistake-free otherwise. 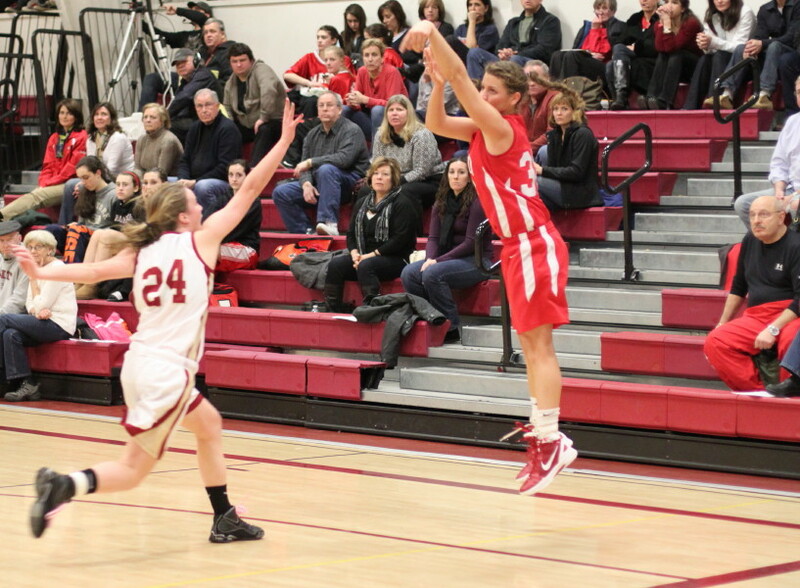 Kendra Dow made several long/strong throws from short. 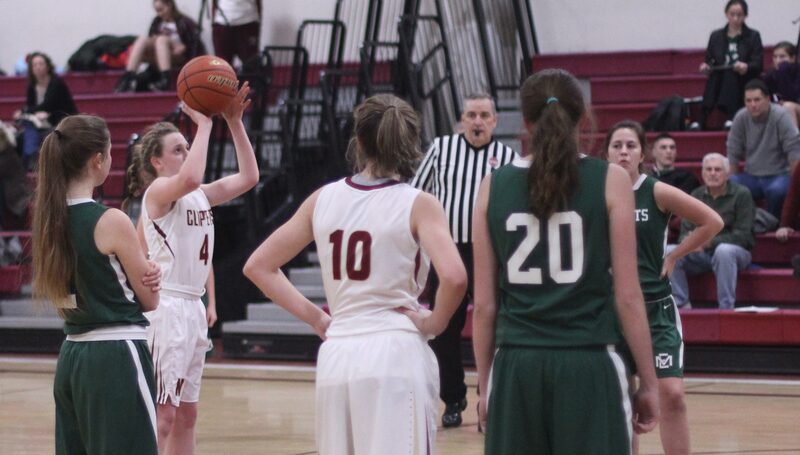 The most important Clipper play in the game was turned in by leftfielder Catherine Casellini. 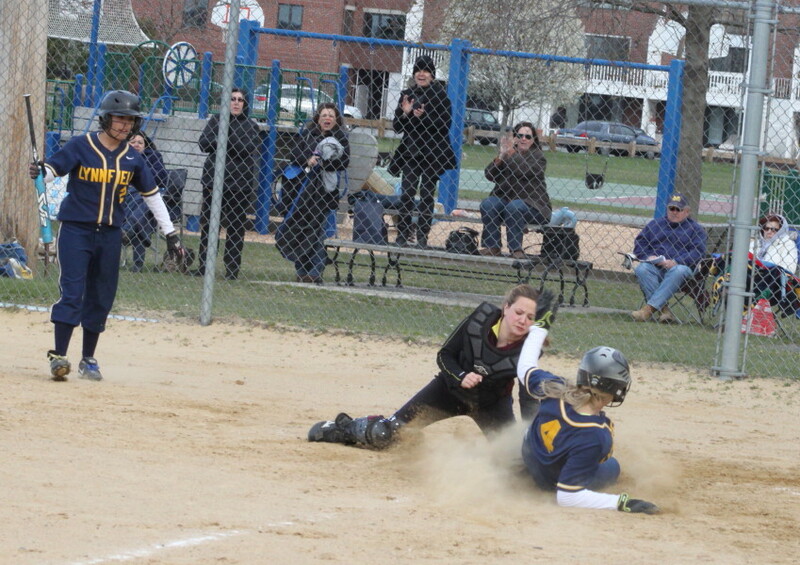 In one of the early innings, catcher Lauren Singer tried to nail a runner getting back to third. 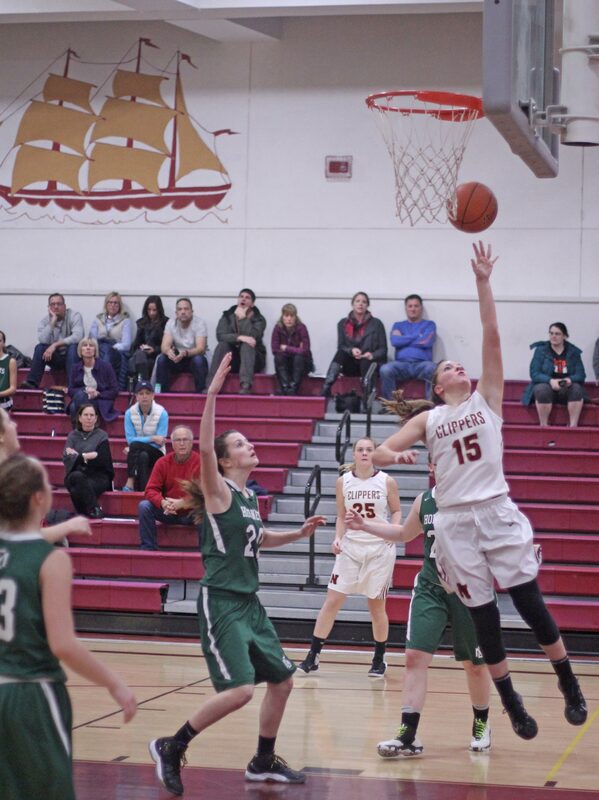 Her throw sailed over third baseman Maddie Stanton’s head……but there stood Catherine, where she was supposed to be, backing the play up. 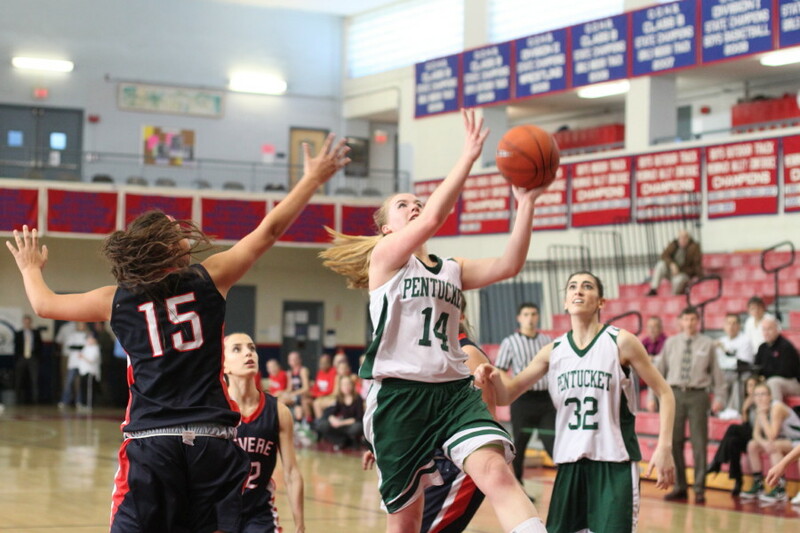 Catherine caught the errant throw and the run was saved. 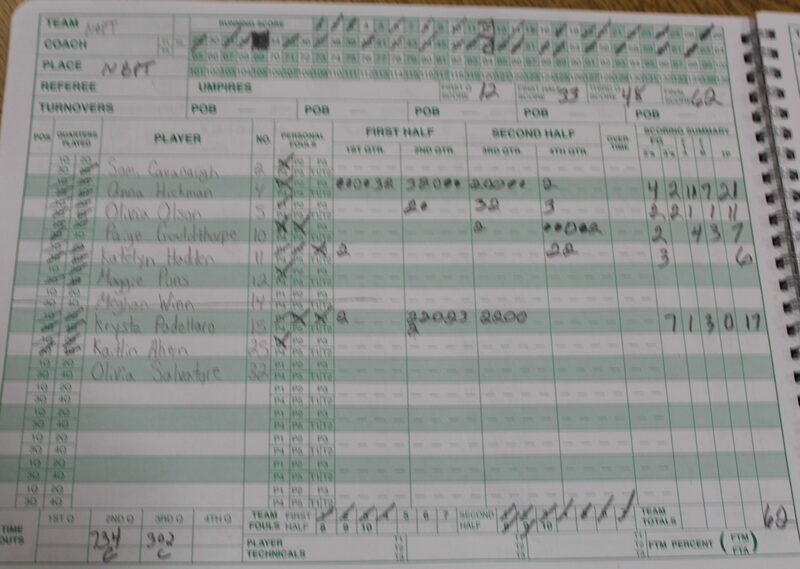 And against a good team like Rockport, all those things had to be in place or the result would have been different. 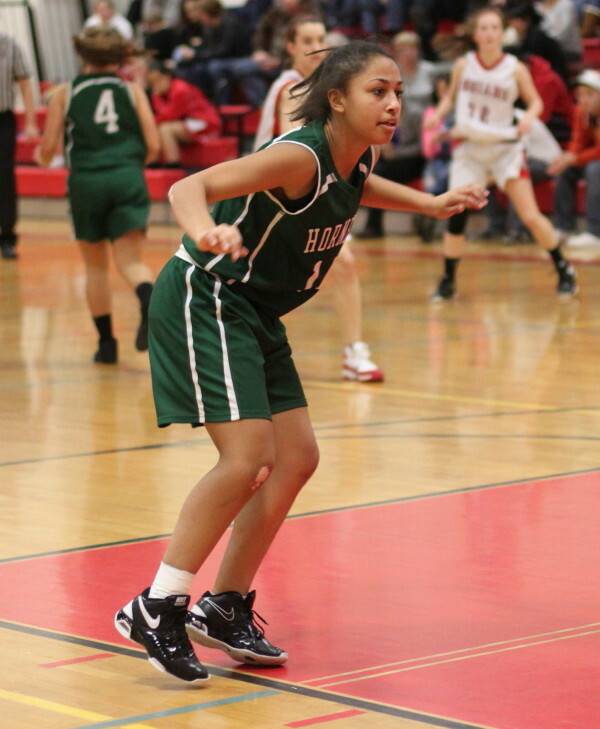 Rockport’s Kristin Turner pitched well enough to win and the defense behind her, especially shortstop Gabby Muniz, was very good. However, with base runners all over the place Rockport never turned the makings of big innings into realities with a clutch hit or two. 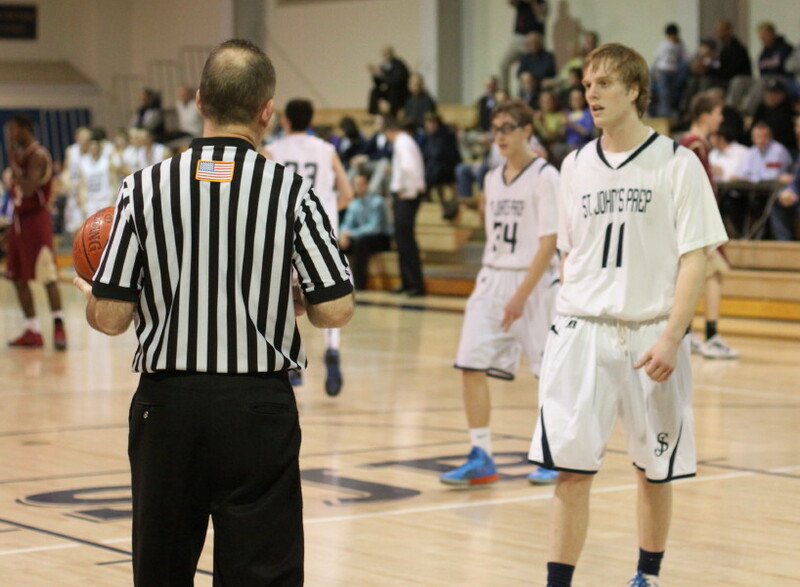 And if you’re looking for just one reason for the Viking loss, pin it on base running. They made three outs on the base paths. One runner was picked off third, another was out by plenty at the plate, and the final out of the game was a failed attempt at stealing second. 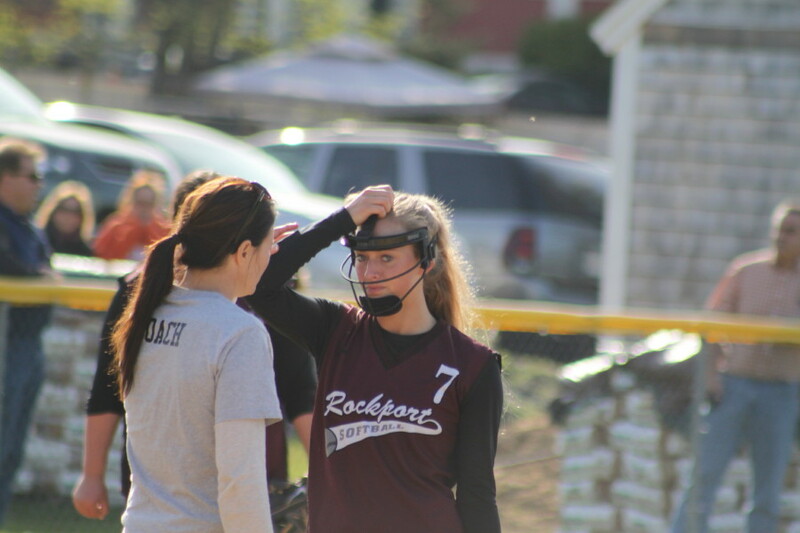 Rockport pitcher Kristin Turner talks with Coach Diane Parisi after getting hit by a line drive. 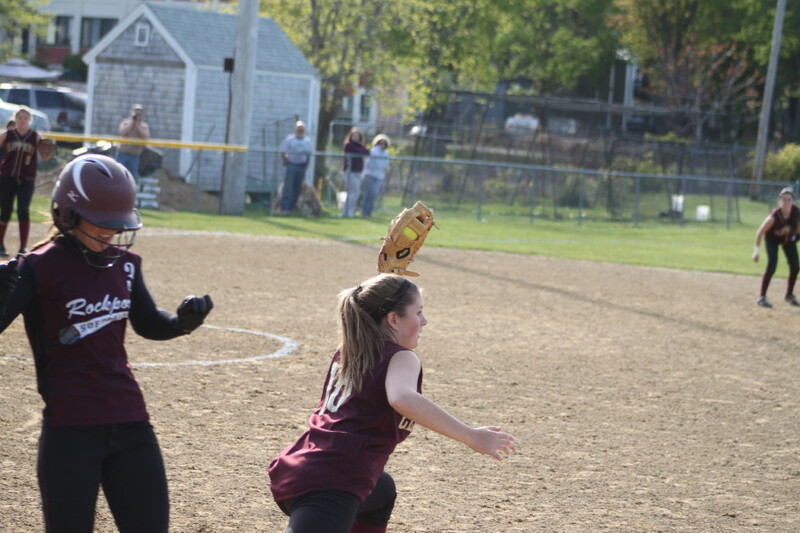 A scary moment happened in the sixth inning when a sharp Lea Tomasz liner grazed off the top of the head of Rockport pitcher Kristin Turner. She and the rest of us were thankful that she was wearing a face shield. The weather was downright pleasant at Cashman Park. What happened to the wind, mist, and temps in the 40s? 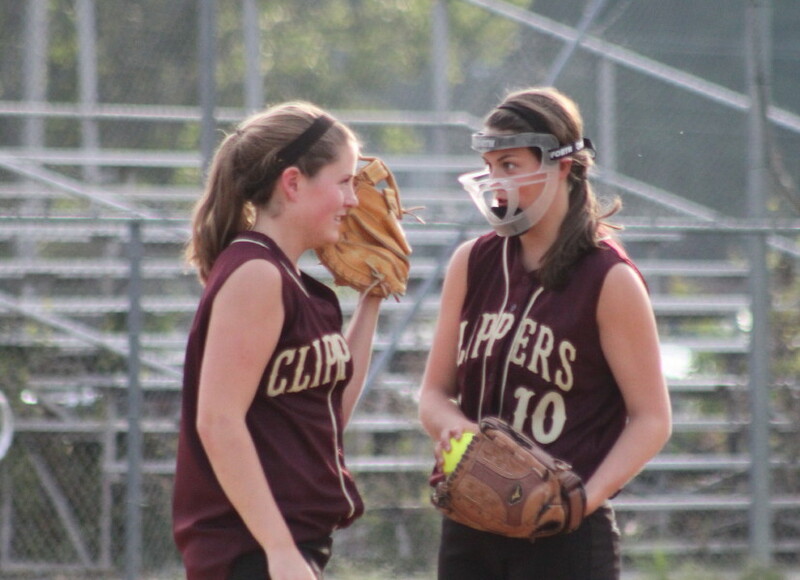 I learned at the game that Kristin Turner learned to pitch from her older sister who pitched for Beverly. 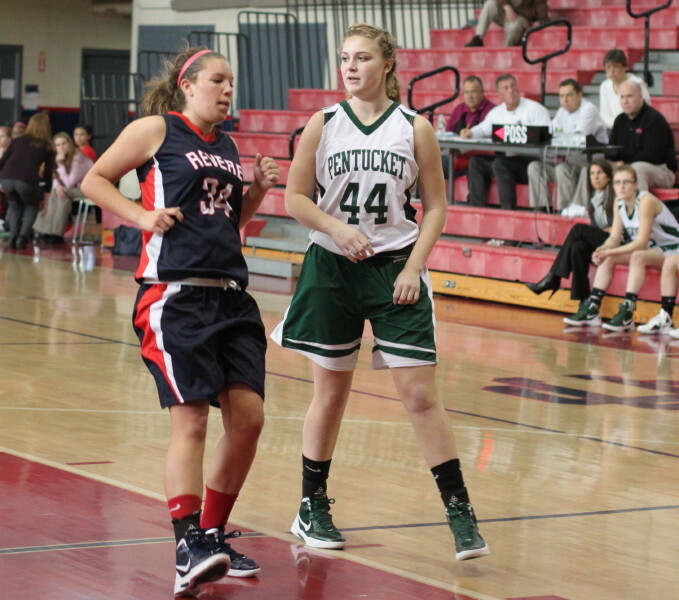 The older sister now attends Salem State. 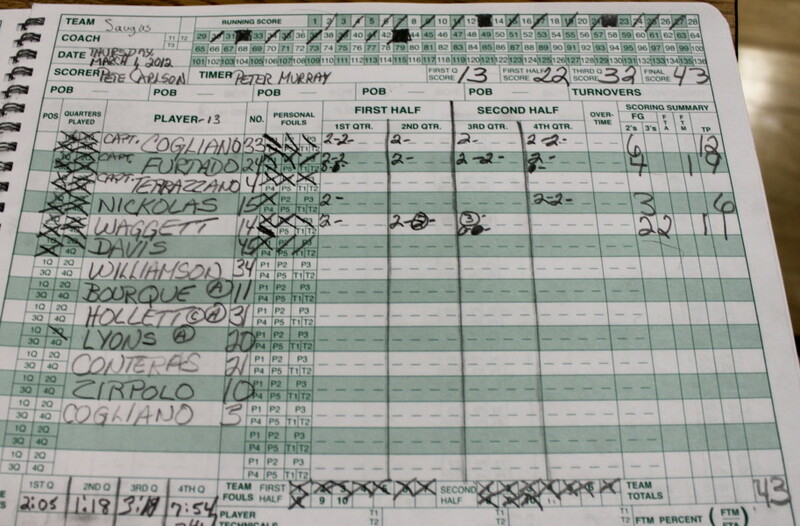 I thought that there might be some sort of on-site newspaper coverage of the game. 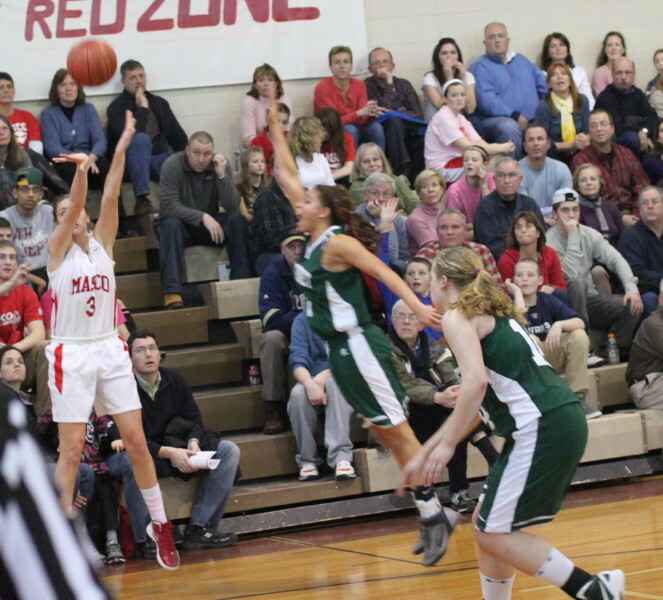 However, when I checked the CAL schedule afterwards for today, I noticed that 10-1 Masco was playing 10-1 Amesbury at Amesbury today. 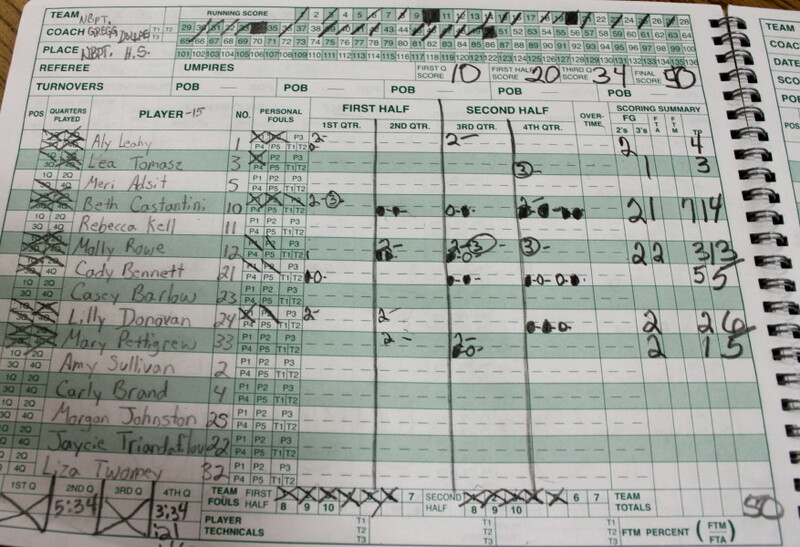 I suspect that the details of that game will be extensively covered. 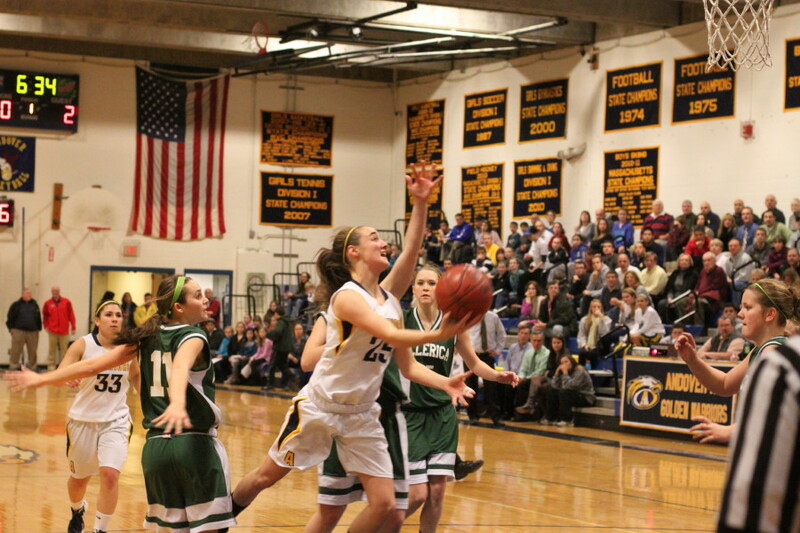 Rockport will host Amesbury on Wednesday, weather permitting. 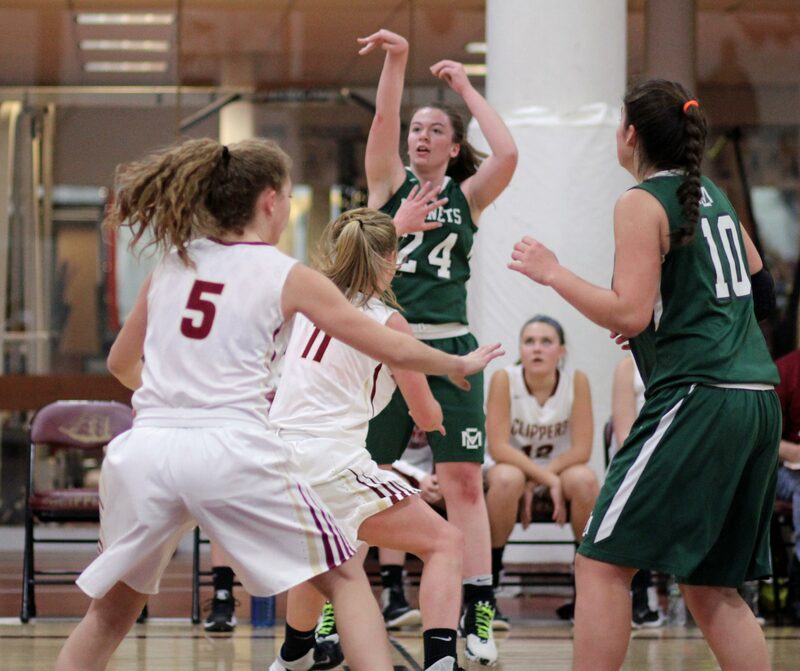 On the same projected rainy day, Newburyport is scheduled to visit Pentucket. Rockport catcher Mollie Watson catches a foul pop. 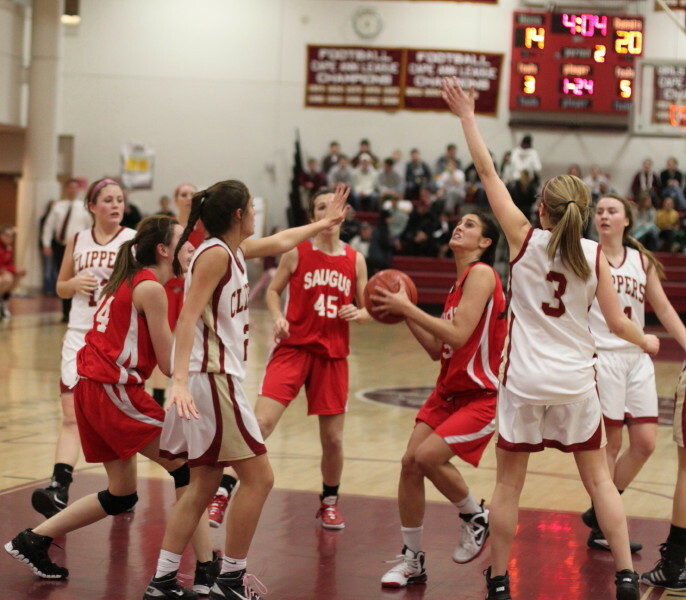 Beth Castantini moves in to catch a deflection off of the glove of Maddie Stanton. 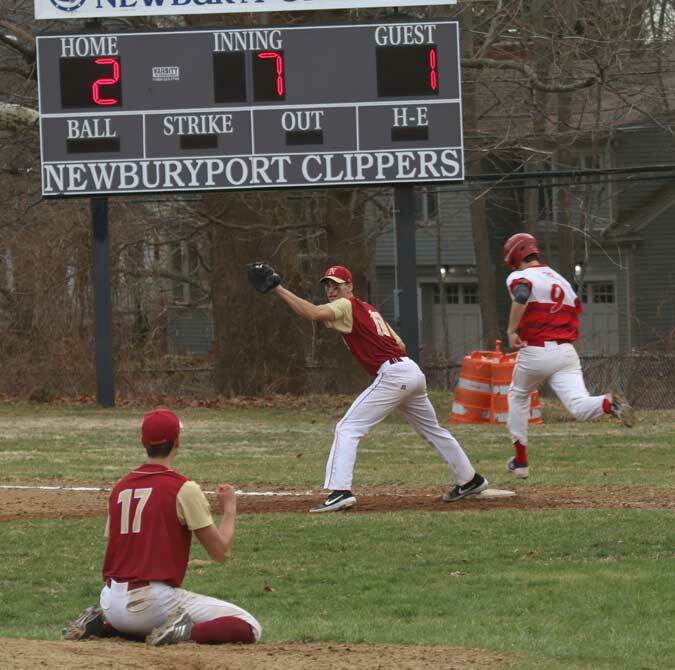 (Newburyport) The Newburyport Clippers hung on to defeat Lynnfield, 3-2, at cloudy, windy Cashman Park on Monday afternoon in nonleague action. Not until dangerous Mel Mancinelli’s pop nestled into Clipper second baseman Jackie Krusemark’s glove for the final out was this game a W for the home team. The inning before (6th) Mel had slammed a very long triple to deep centerfield and in this at bat had teammates on first and third trailing by a run. 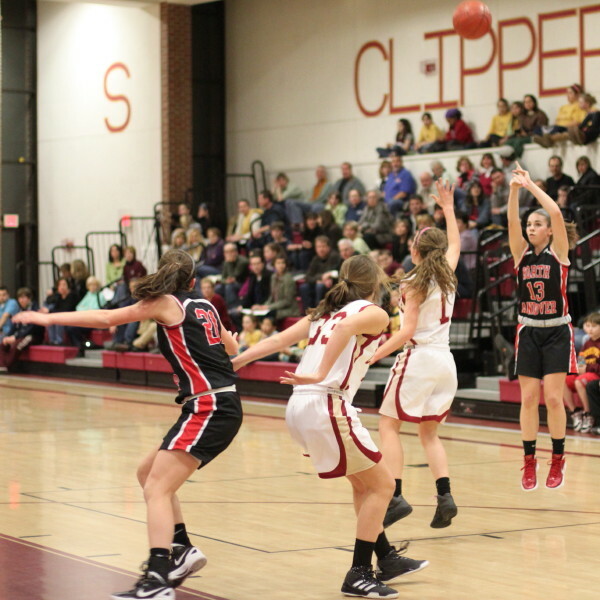 But the Clippers survived to win their season opener as well as an initial win for new coach Lori Solazzo. For the Clippers. 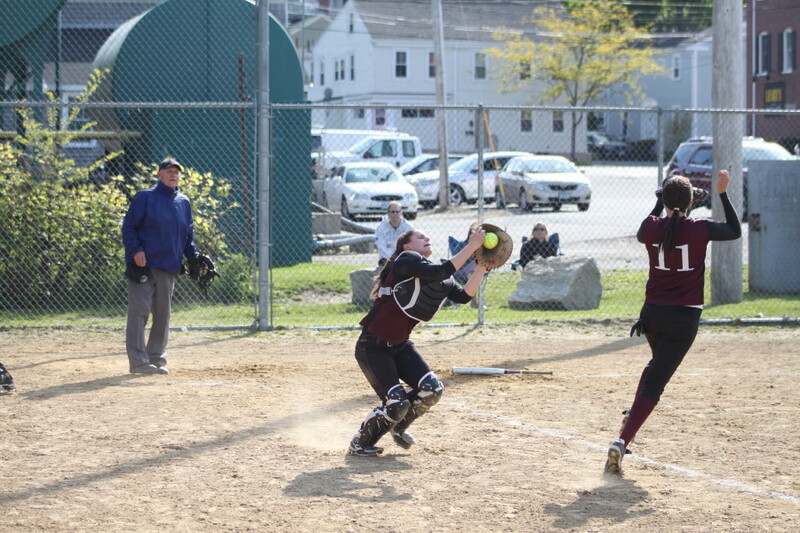 retiring Mel Mancinelli for the last out was important but maybe even more important was a throw from centerfielder Lea Tomasz to catcher Lauren Singer that nailed Julia Goldstein for the final out of the sixth inning. The Pioneers had to settle for two runs, and a tie score, in that inning. 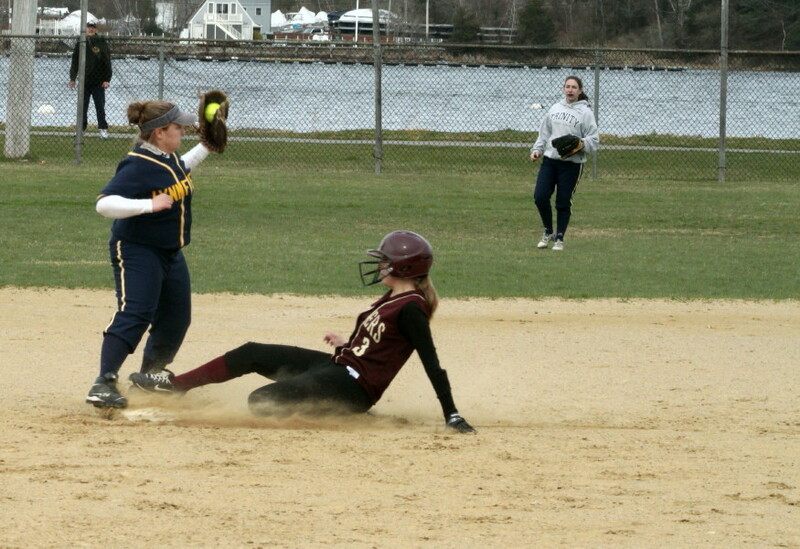 Julia Goldstein tagged out at the plate. 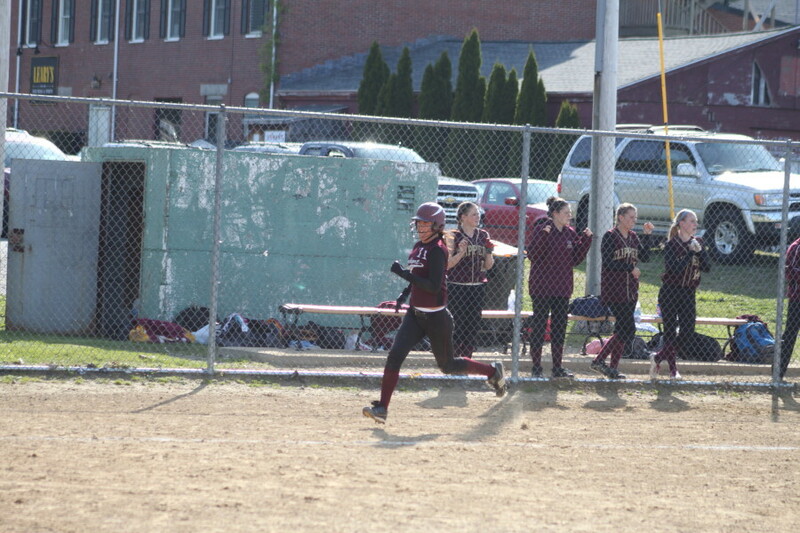 Newburyport pushed across the actual game winner in the bottom of the sixth. 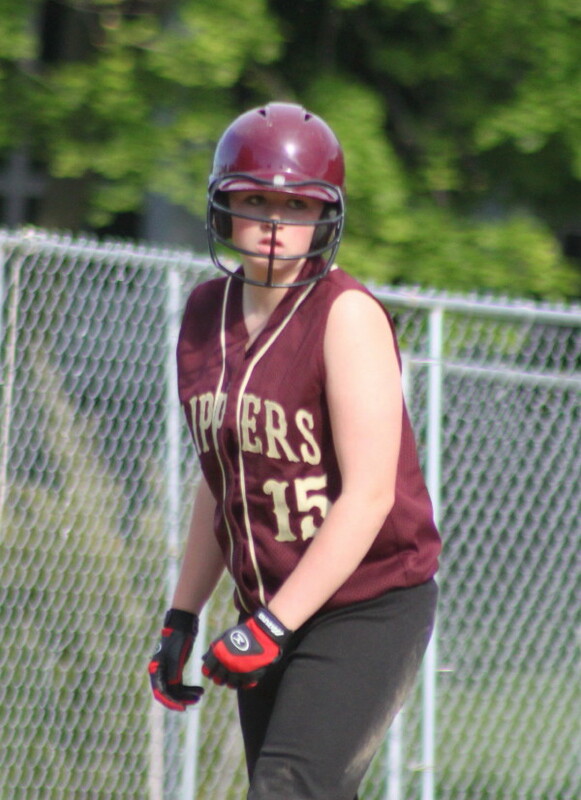 Maddie Stanton singled to center and reached third after a passed ball and a fielder’s choice. Kendra Dow’s single to right drove Maddie home. 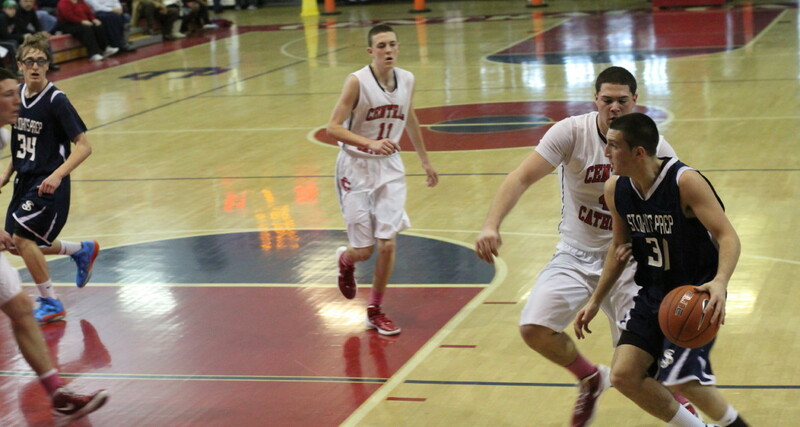 The Clippers picked up their other two runs in the 4th. 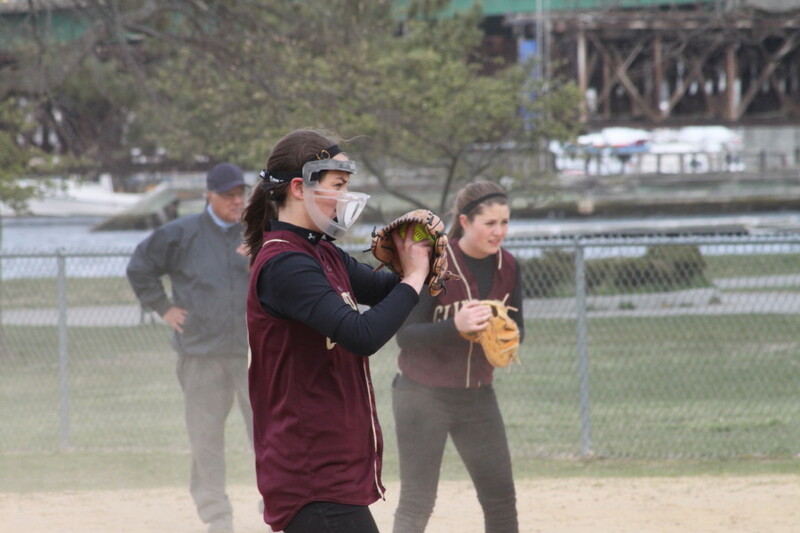 The wind/dust seemed to catch up to Pioneer right fielder Julia Sheehan and she dropped a catchable fly ball off Beth Castantini’s bat and she reached third. 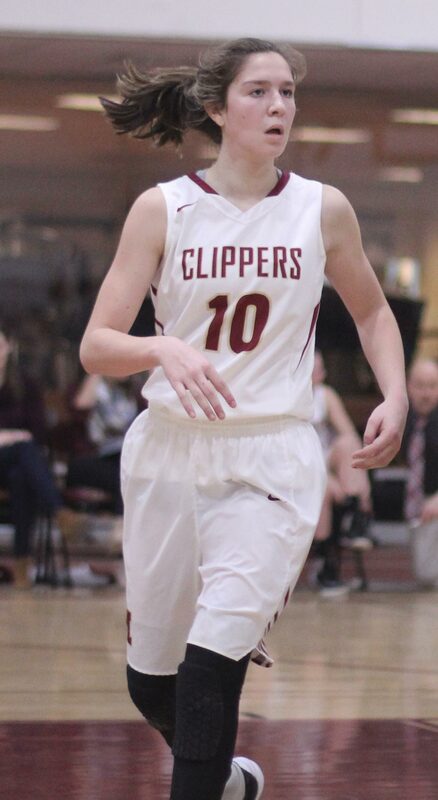 Lea Tomasz scored the Clipper’s first run on the 3-base error. 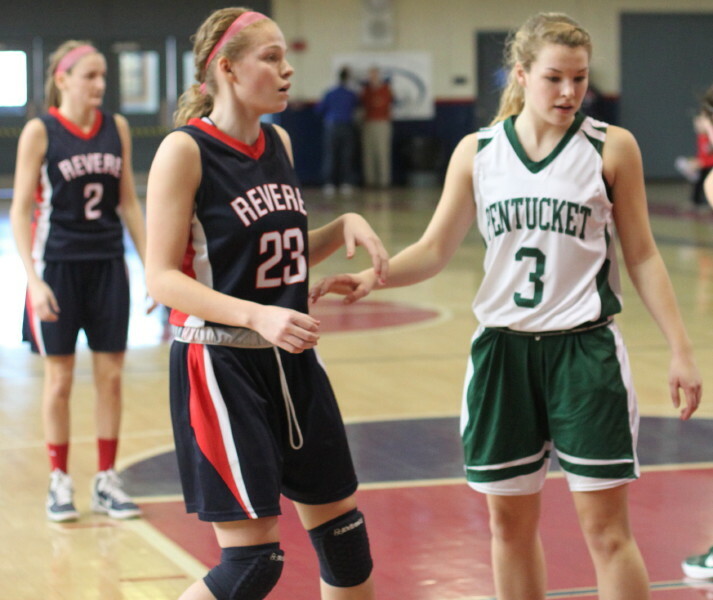 Later Maddie Stanton drove Beth across for run #2. That 2-0 lead held up until the sixth when the Pioneers tied the score. 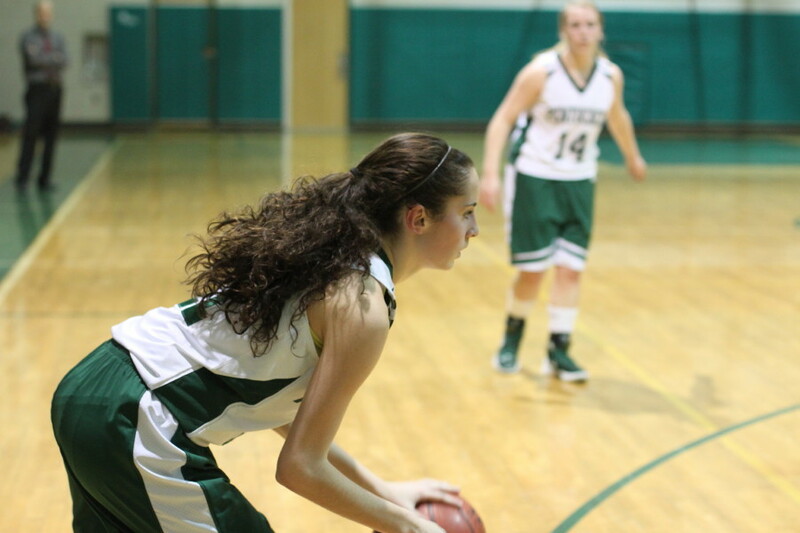 Mel Mancinelli was delivered by Amanda McQueen’s single. 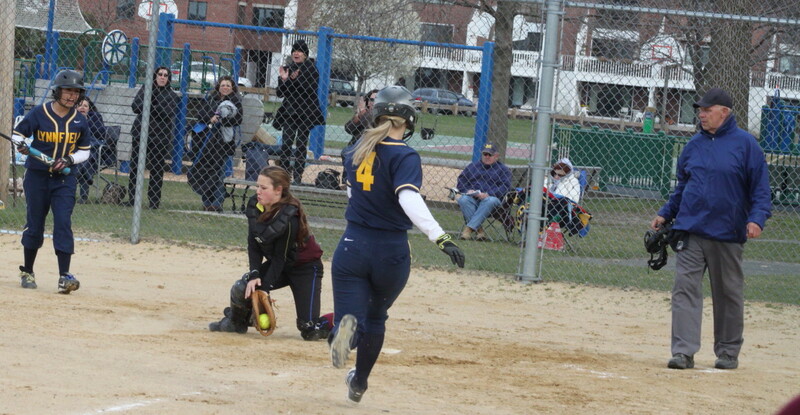 Two wild pitches later Amanda was on third and from there came home on Jackie Whelan’s single. 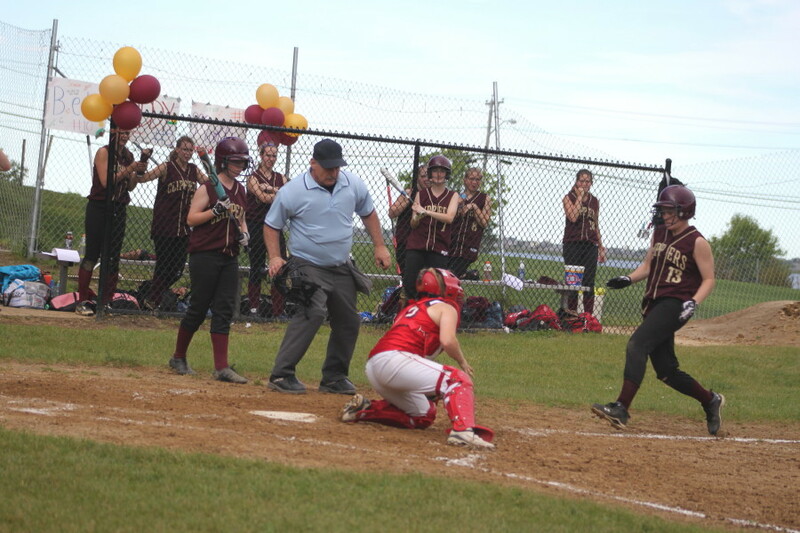 Pioneer Amanda LaSpina was called out for runner interference in the 3rd against first baseman Molly Rowe while Molly was nailed with the same call interfering with shortstop Katie Rowe in the 4th. 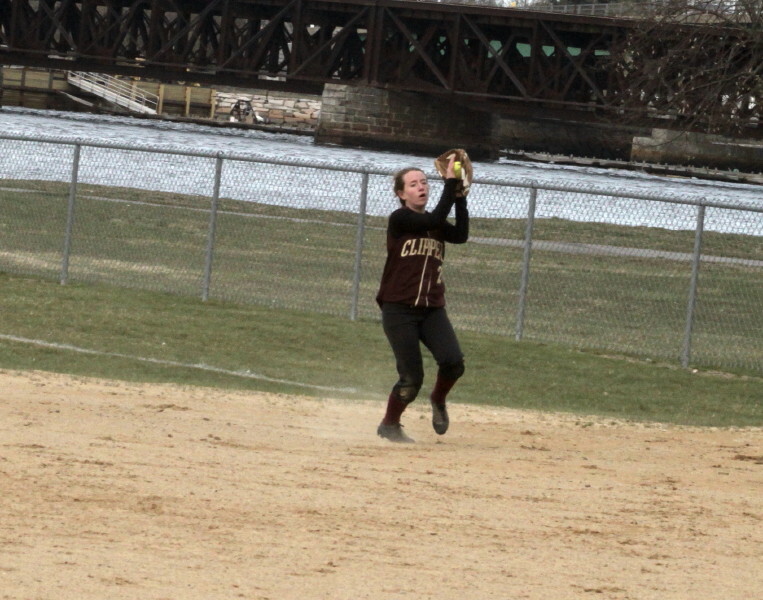 Centerfielder Sarah Flood made a nice running catch in the 5th on Beth Castantini’s sinking liner. 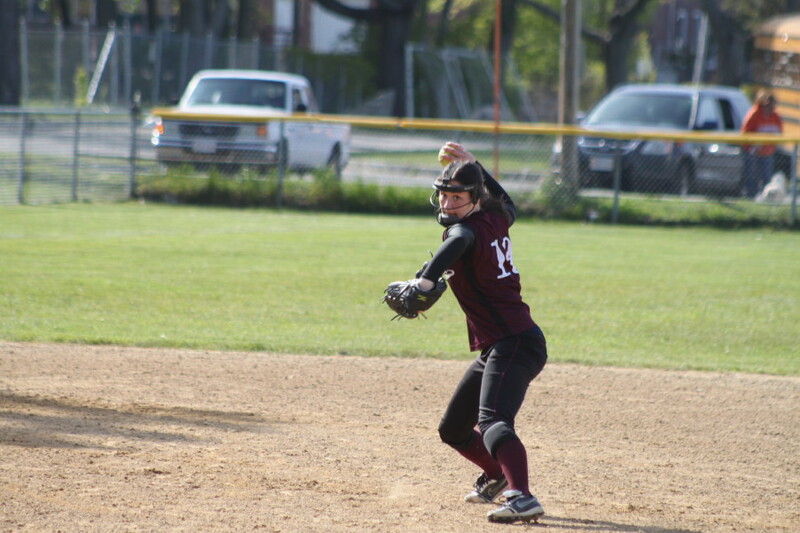 Winning pitcher Beth Castantini finished with seven K’s getting at least one in every inning except the seventh. 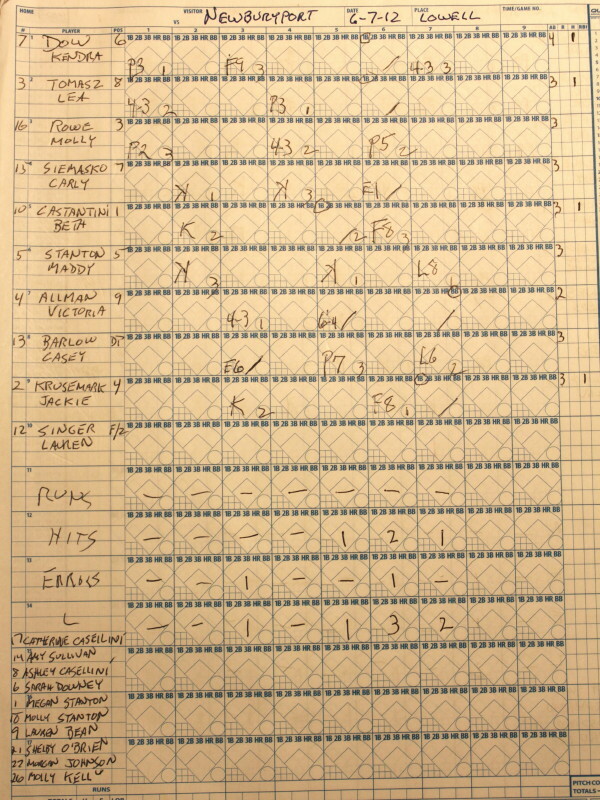 The umpires had both teams hollering in the seventh inning as close plays went the wrong way depending on the sideline you were on. 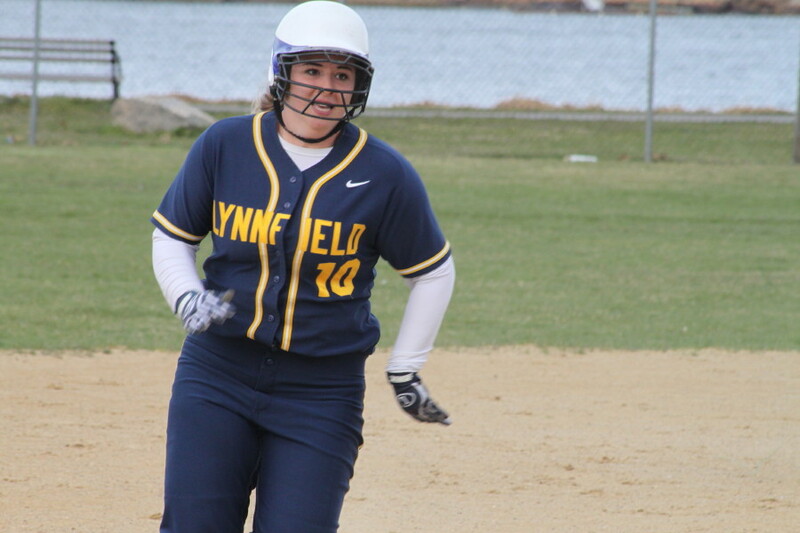 Jackie Whelan scattered six hits for Lynnfield. She also drove in a run. 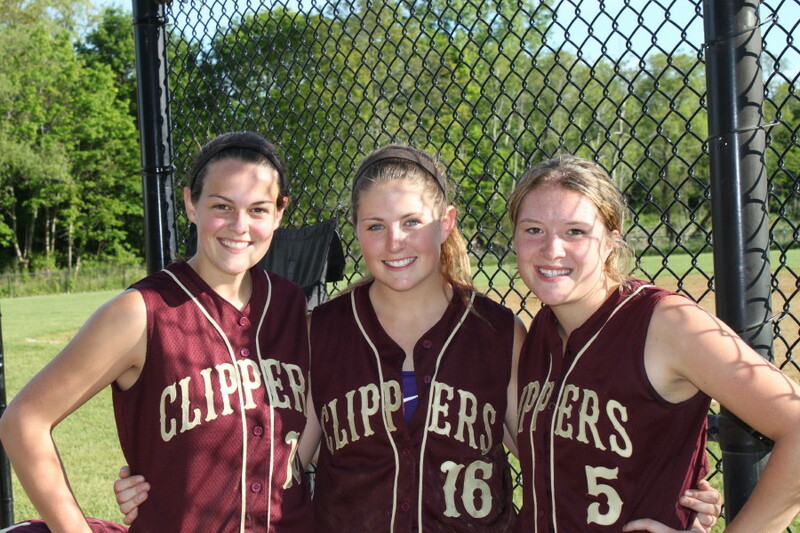 Lea Tomasz, Maddie Stanton, and Kendra Dow had two hits each for Newburyport. 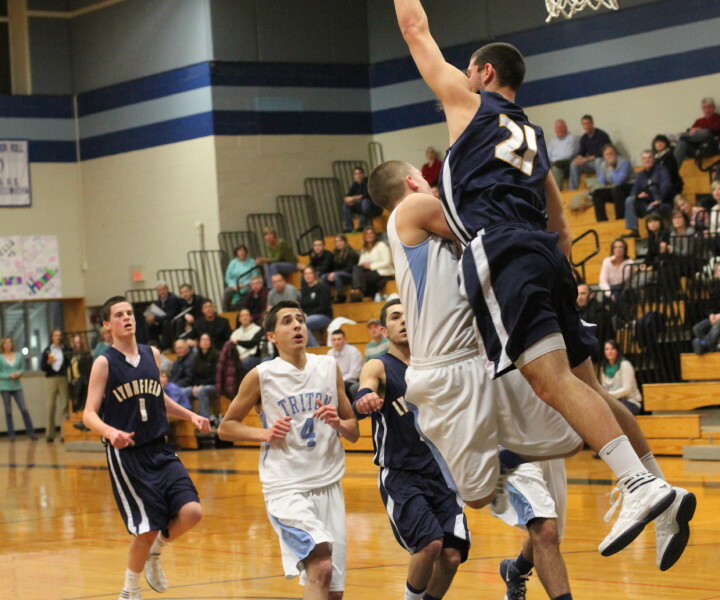 Lynnfield (1-1) hosts Ipswich on Wednesday. 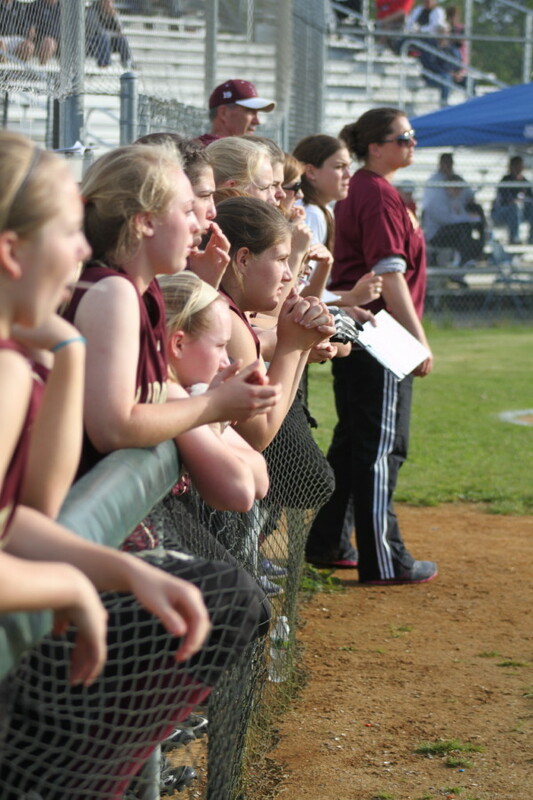 Newburyport (1-0) returns to Cashman Park on the same day to play North Reading. 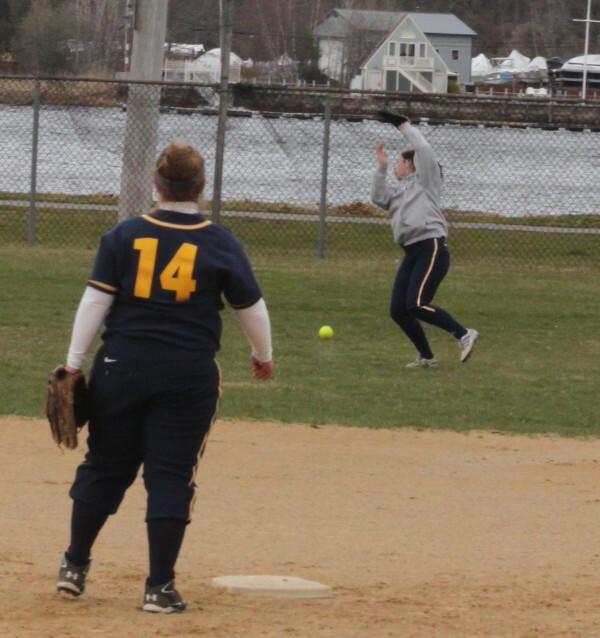 Lynnfield probably should have guessed it wasn’t their day in the 4th inning when Jackie Whelan’s popup bounced off of Maddie Stanton’s glove into Beth Castantini’s. April games at Cashman are always challenging. Today, however, was windier than usual and every now and then the infield dust would swirl toward the Lynnfield side of the field. 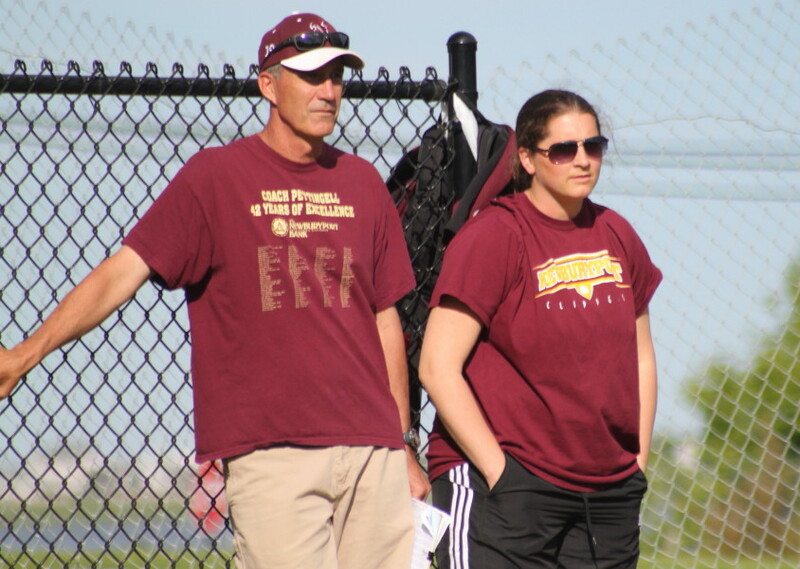 Former NHS coach Peter Murray was an interested spectator. 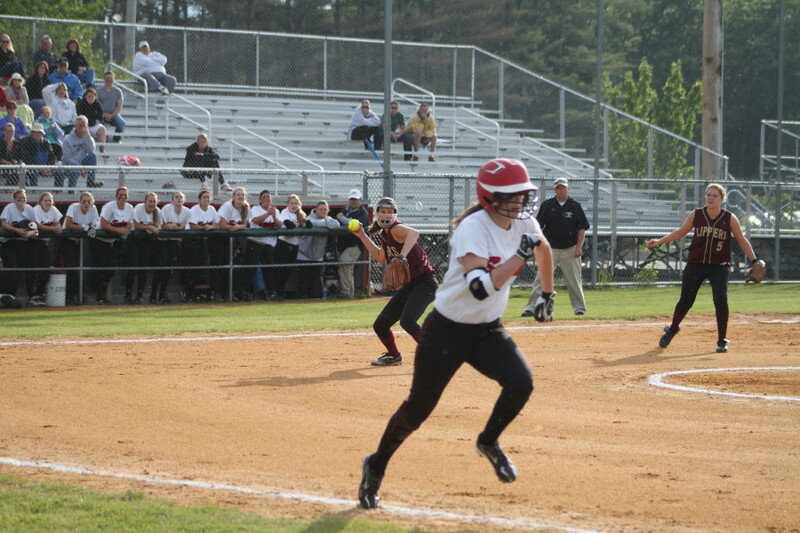 Second baseman Jackie Krusemark gets final out. 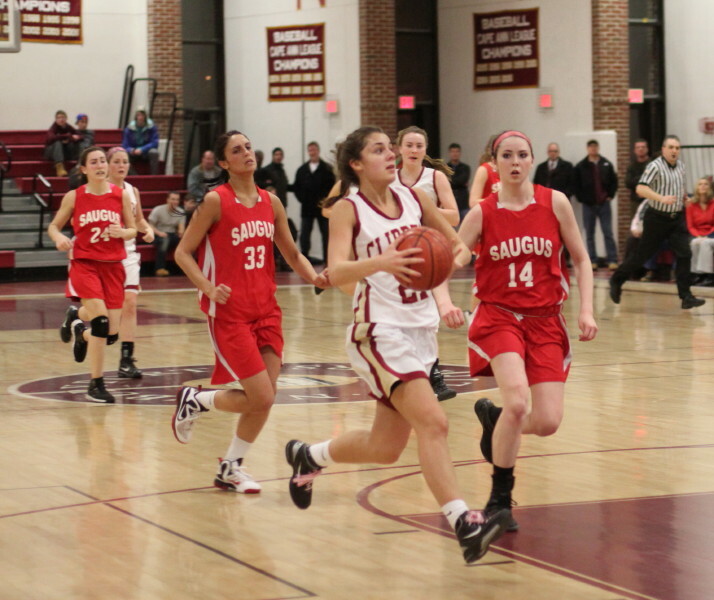 Gabby Cogliano (12 points) looks for an opening against the Newburyport defense. 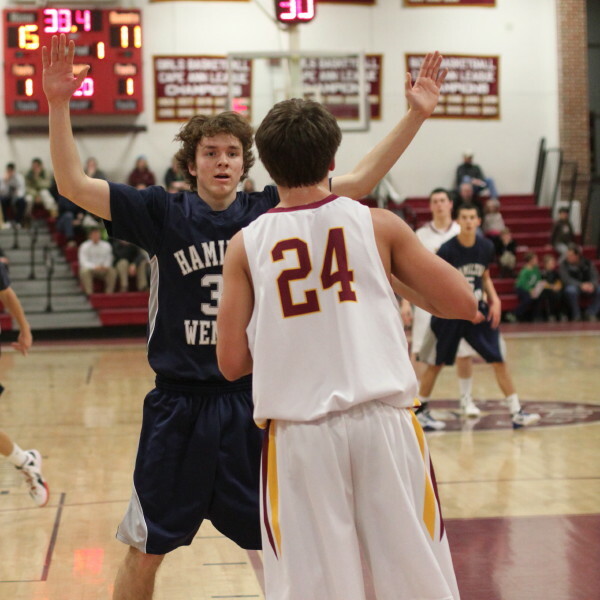 (Newburyport) In a game with fifty-two turnovers it was hardly a work of art but Newburyport rallied from a 3-point deficit with 3 ½ minutes left to defeat Saugus, 50-43, on slippery Thursday night at Newburyport. 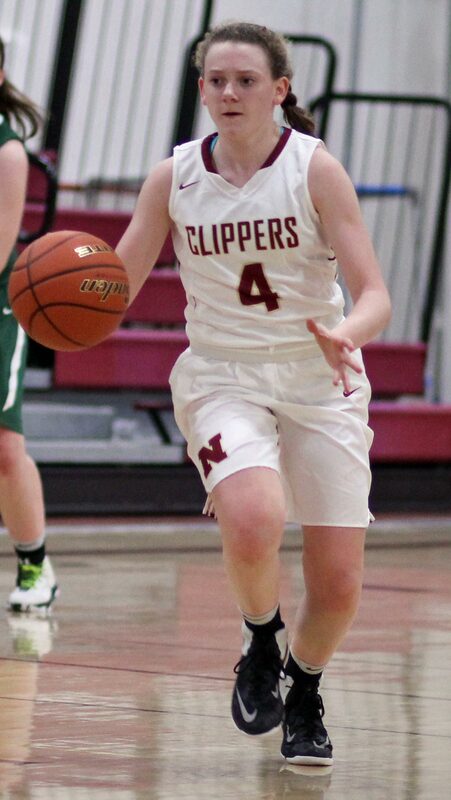 Newburyport (14-7) now moves on to the Quarterfinals of D3 North and will face Pentucket on Sunday afternoon (1PM) at Whittier in Haverhill. 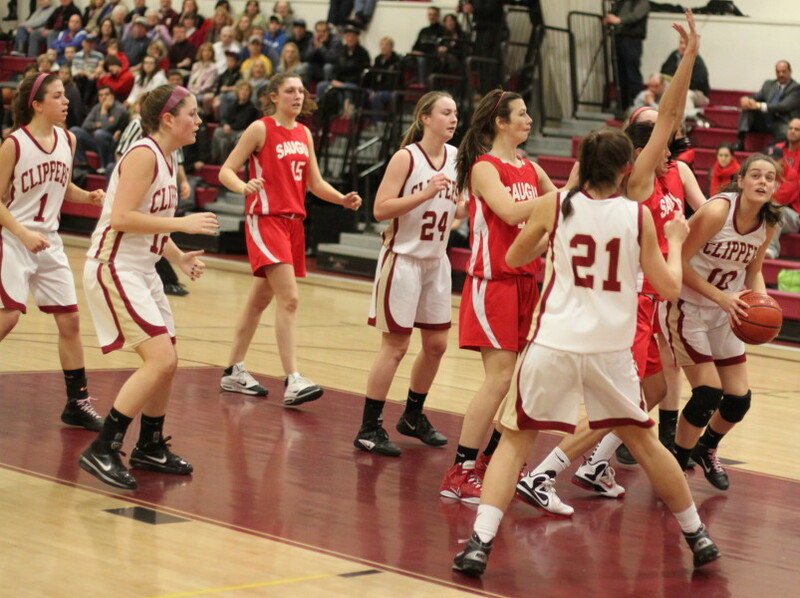 A Gabby Cogliano converted rebound gave the Sachems a 43-40 lead with 3:47 left. 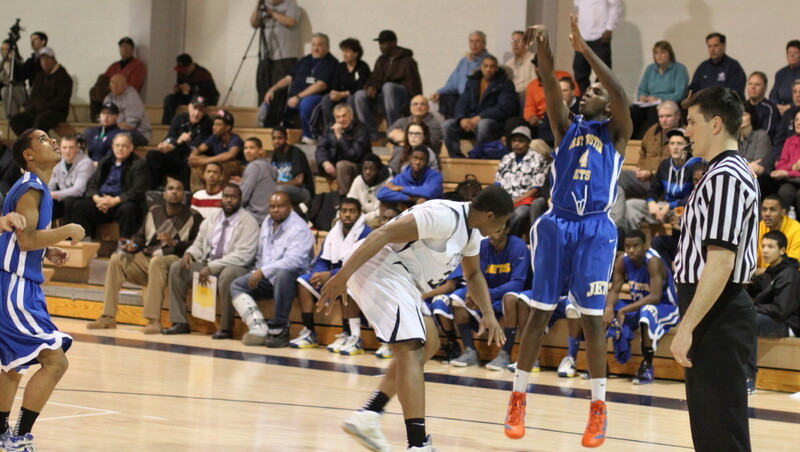 At this point the #11 seed was in position to knock off the #6 seed on the road. 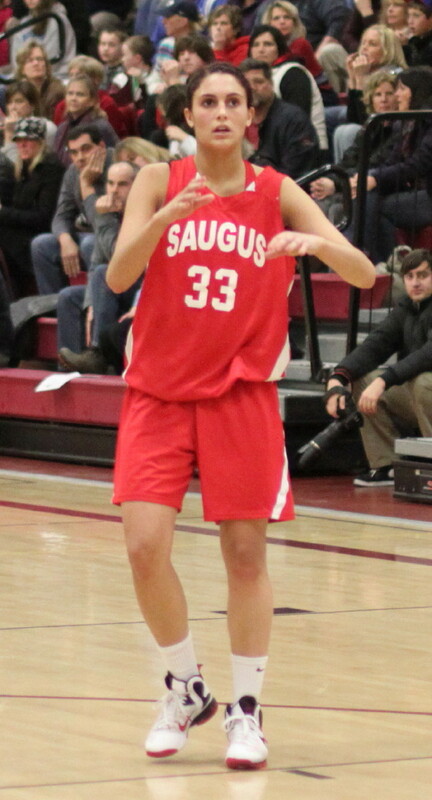 However, Saugus (8-13) would not score a single point the rest of the way and commit four turnovers. 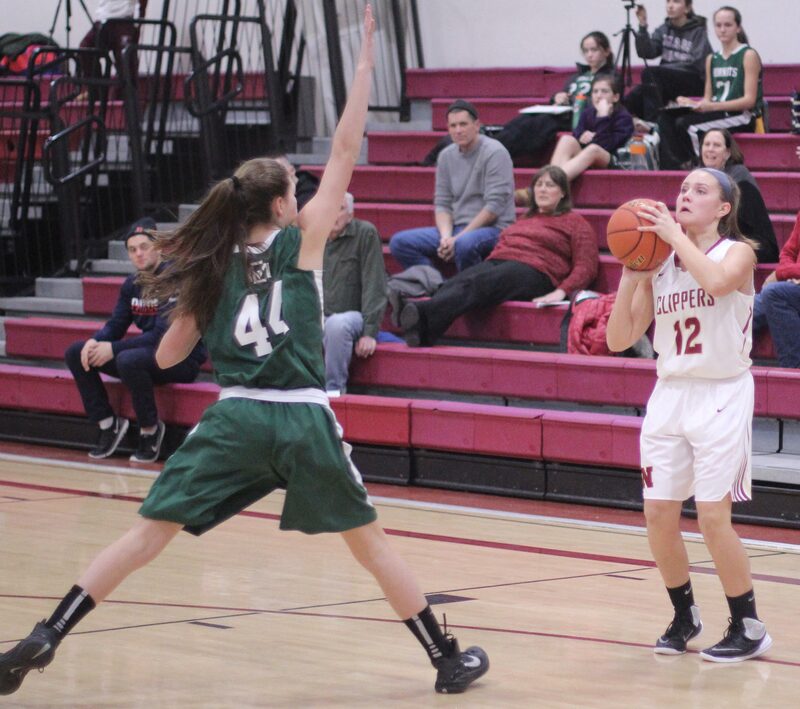 Newburyport had a well setup three from Lea Tomasz and made seven pressure-packed free throws out of eight attempts to grab the victory. 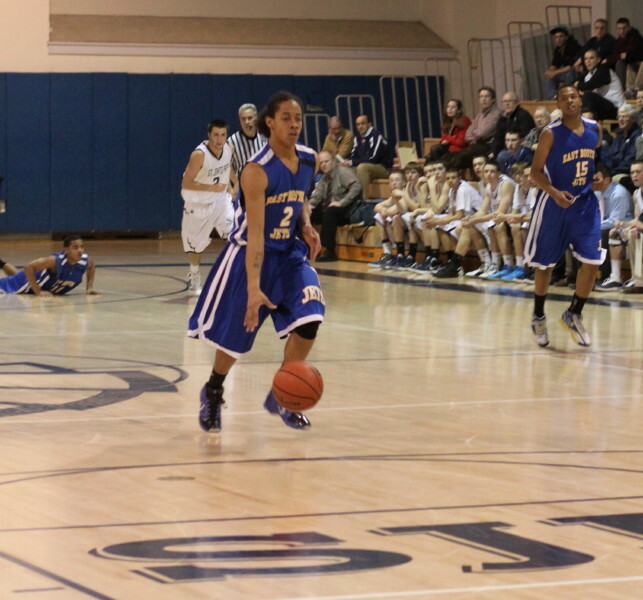 Lea came into the game for an inbounds play on the opposite side of the court. 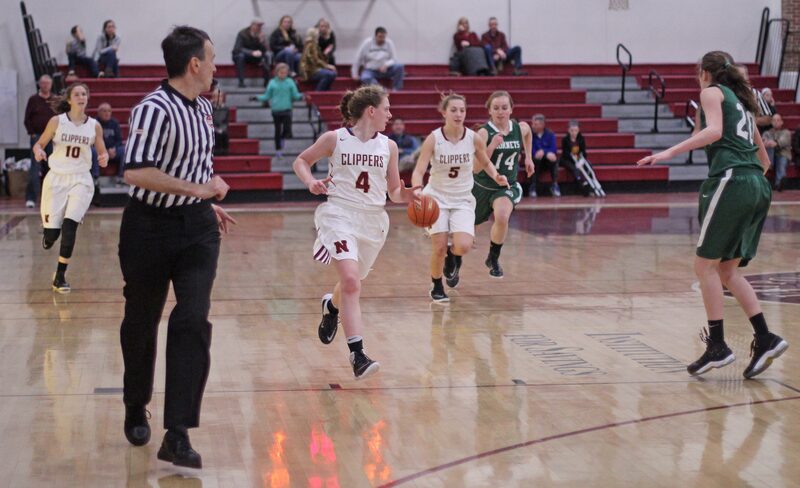 Positioned beyond the arc in front of the Clipper bench, Ally Leahy got the ball to Lea for a clean look and the junior connected. 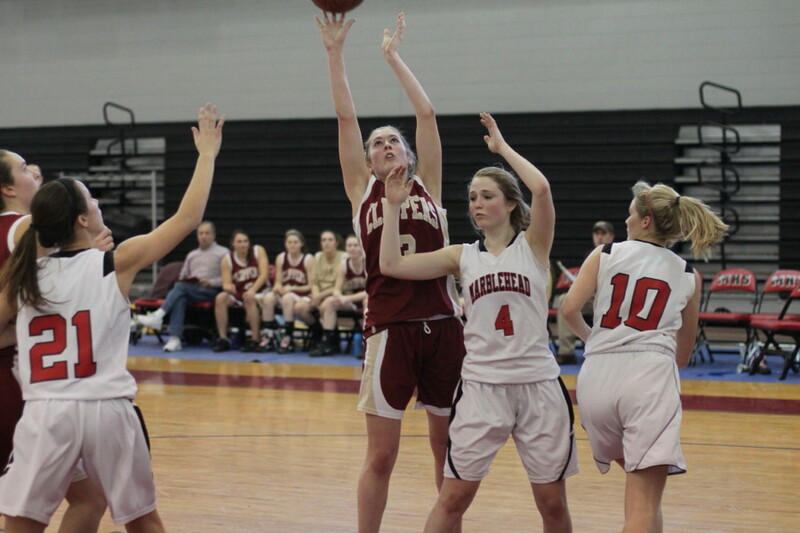 Lea’s triple gave Newburyport a 45-43 lead with three minutes to go. 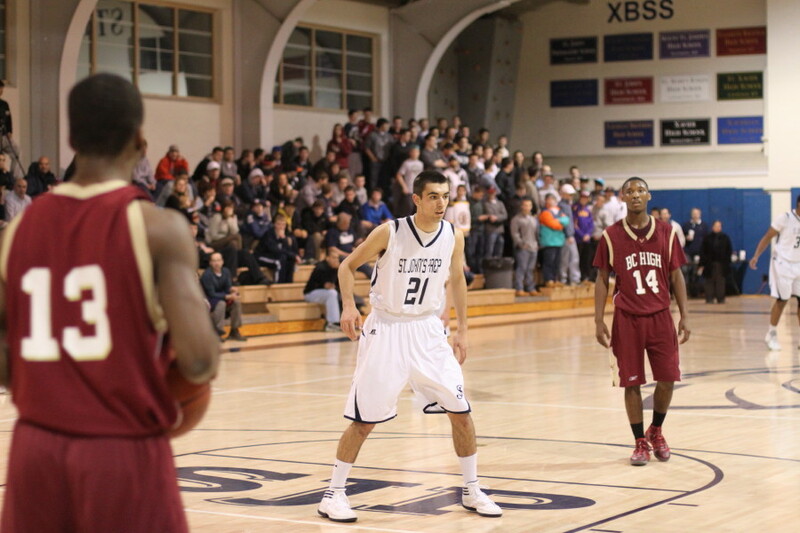 The next 2 ½ minutes the teams took turns missing and turning the ball over. 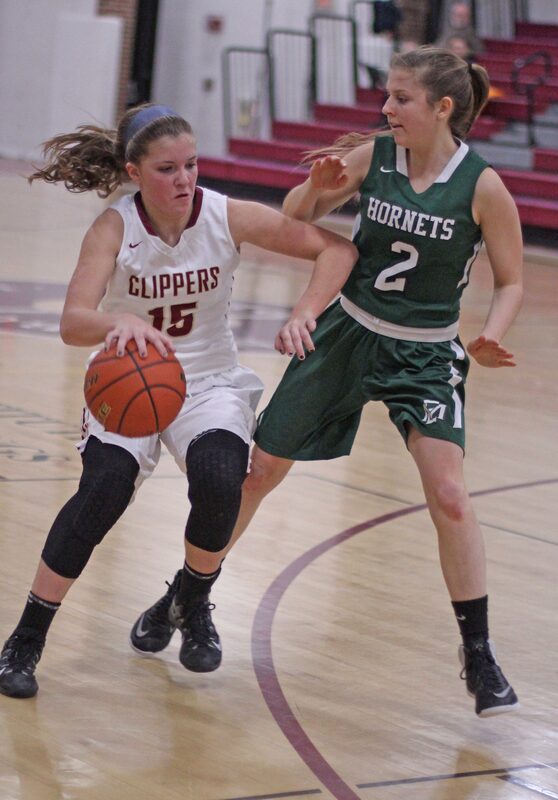 One huge play for the Clippers was a block by Lilly Donovan on Allyssa Furtado in the lane with twenty seconds left. 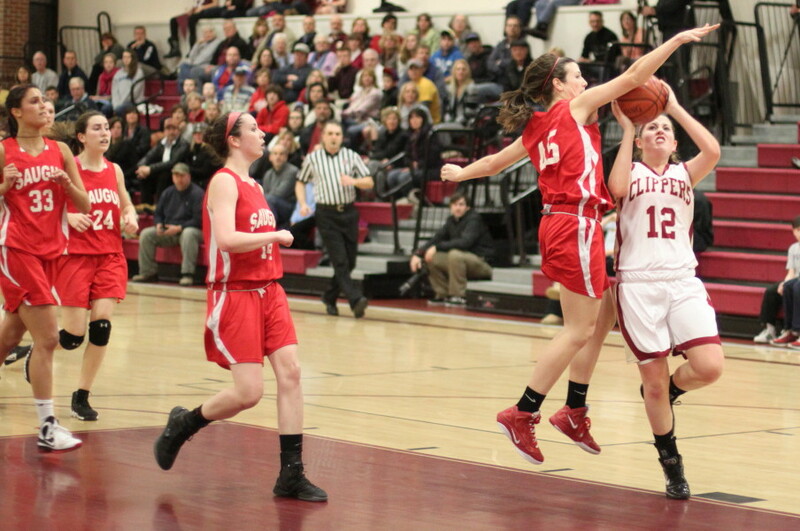 Saugus was forced to foul and Beth Castantini made two free throws with fourteen seconds left to give Newburyport a little breathing room – 47-43. 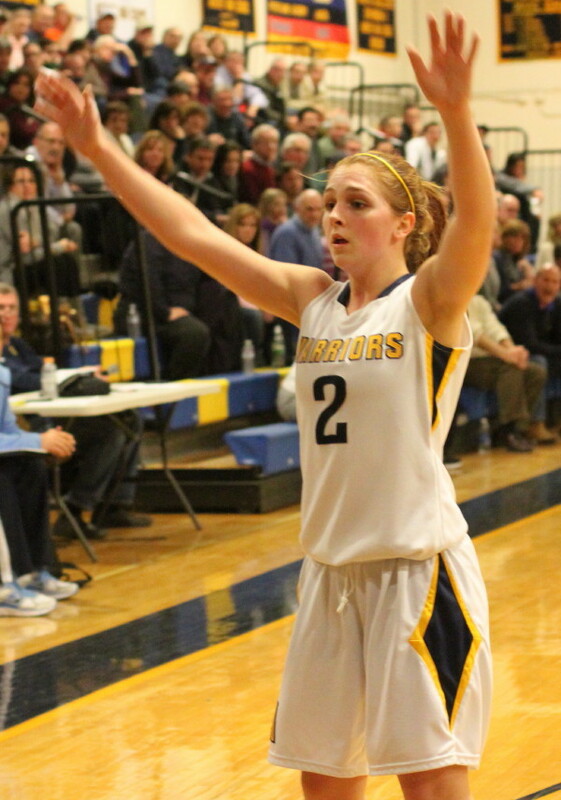 After Stefani Terrazzano missed a three, Cady Bennett was fouled (hard) and made one freebie. 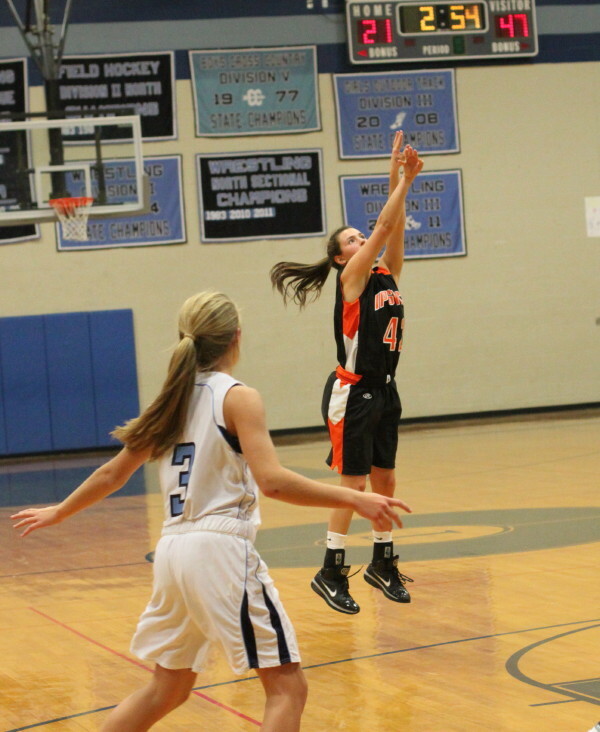 Beth closed out the scoring with two more free throws. 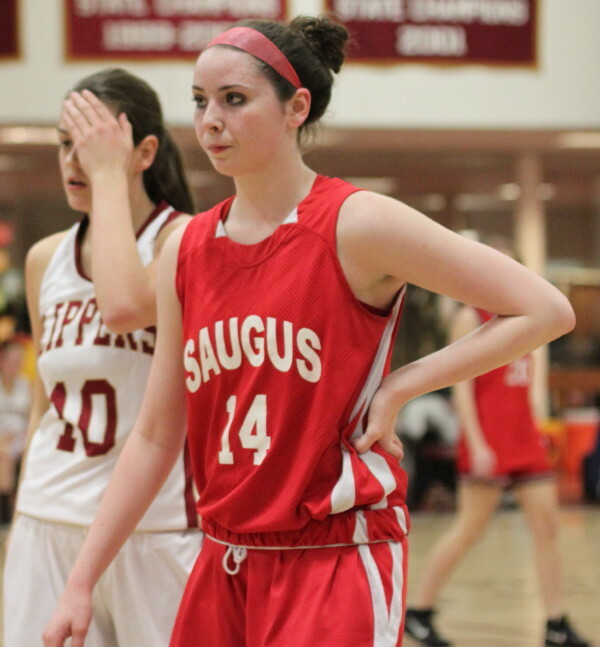 Saugus got up by as many as eight (22-14) in the second quarter but their wasted possessions (thirty-three turnovers) enabled Newburyport to stay in the game. 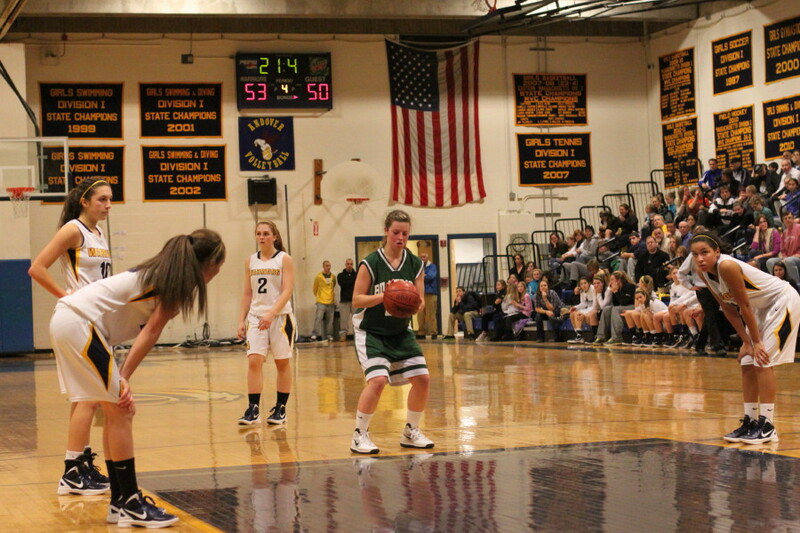 That eight-point lead shrunk to one point as the Sachems had eight turnovers in a five minute stretch. Credit the Clipper defense. They double-teamed anyone who handled the ball and were rewarded for it. 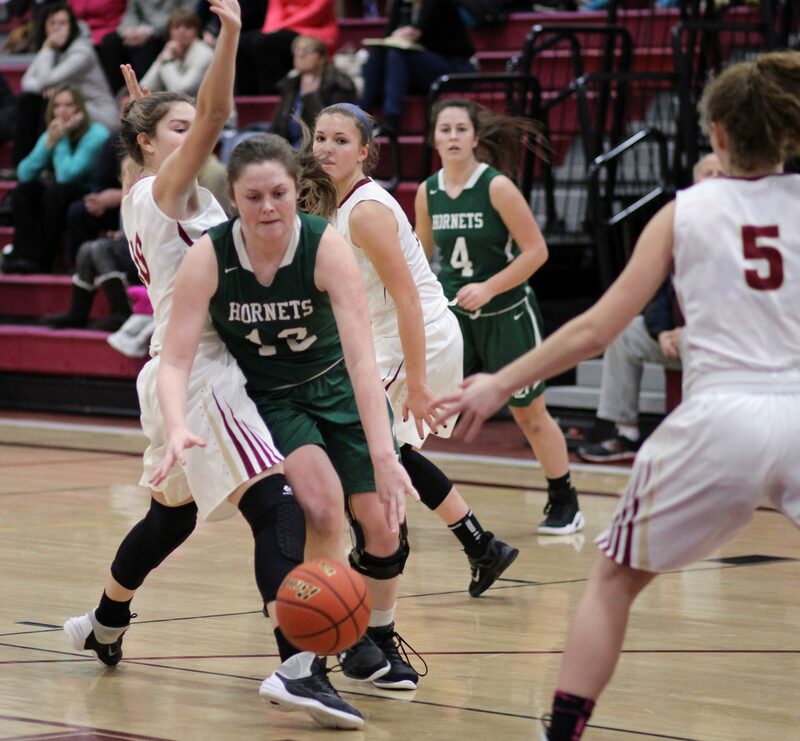 Newburyport put a 12-2 run together in the third quarter featuring two steals that led to points and a Molly Rowe long one. 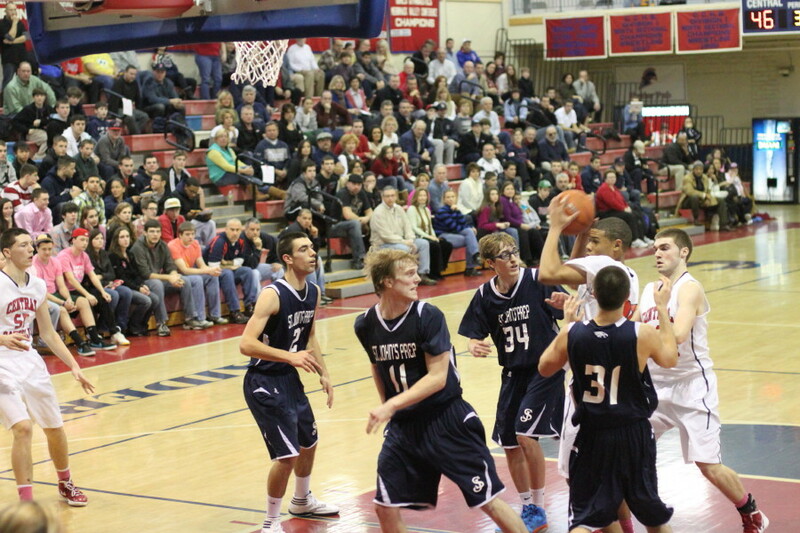 This surge put the Clippers in front, 33-27, with 2 ½ minutes left in the third quarter. 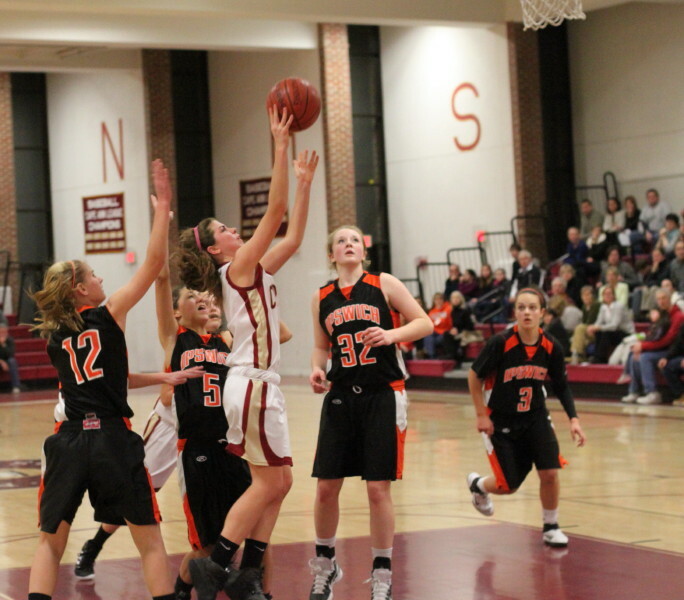 In the fourth quarter another Molly Rowe three had Newburyport leading 39-35 with six minutes left. 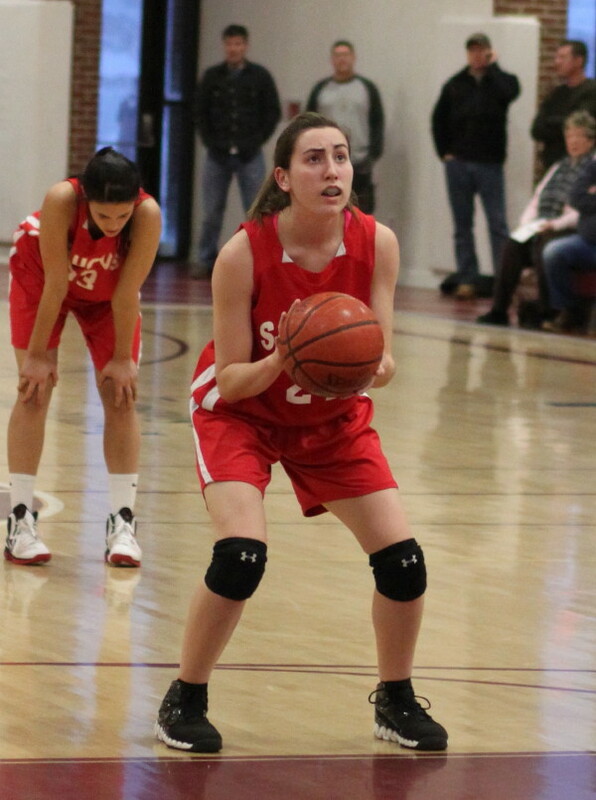 But for the next two minutes the Sachems put up eight points on the inside with the Clippers only answer a Cady Bennett free throw. 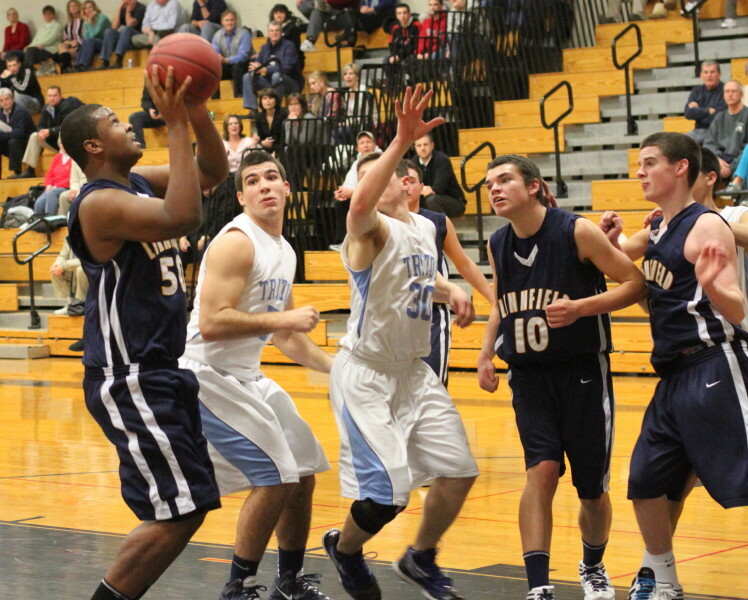 This gave Saugus the 43-40 advantage that slipped away from them in the final 3 ½ minutes. 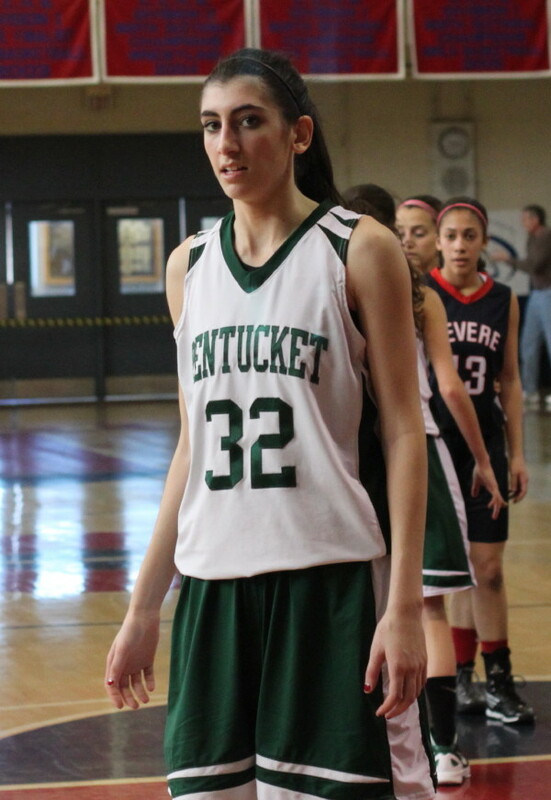 Senior Allyssa Furtado ended her high school career with a very solid nineteen points. 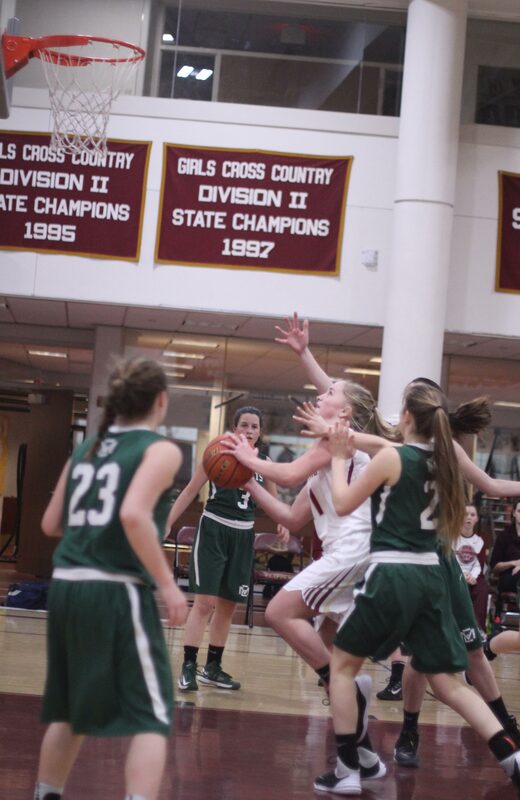 Newburyport can thank their defensive effort for this win. 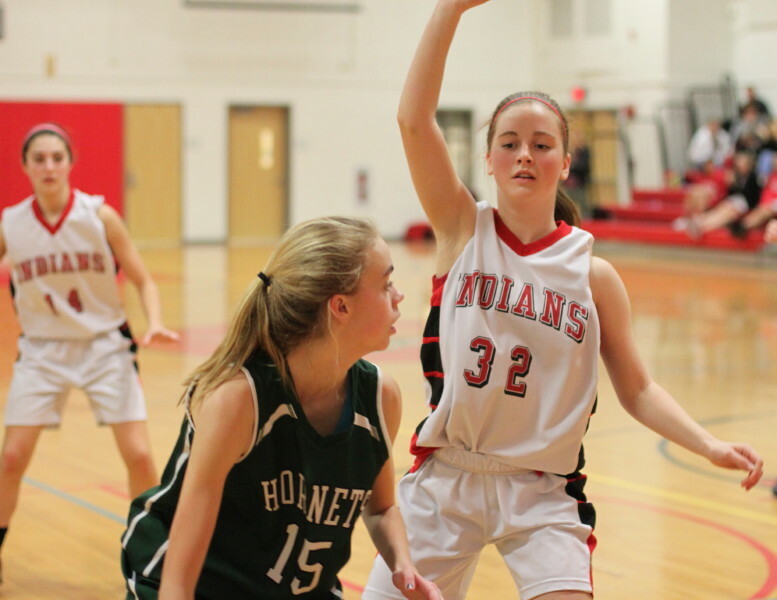 When they started trapping in the second half the Sachems struggled to run any sort of offense. 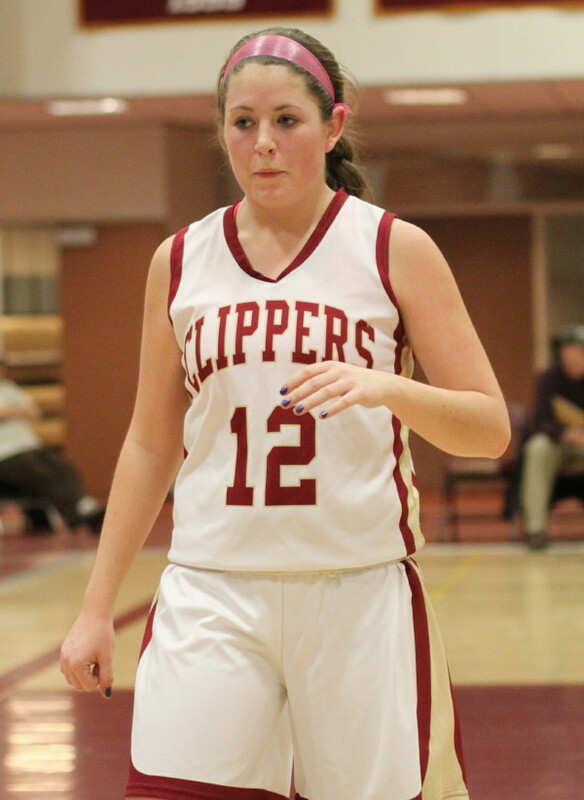 Cady Bennett was the key to the success of the Clipper pressure. 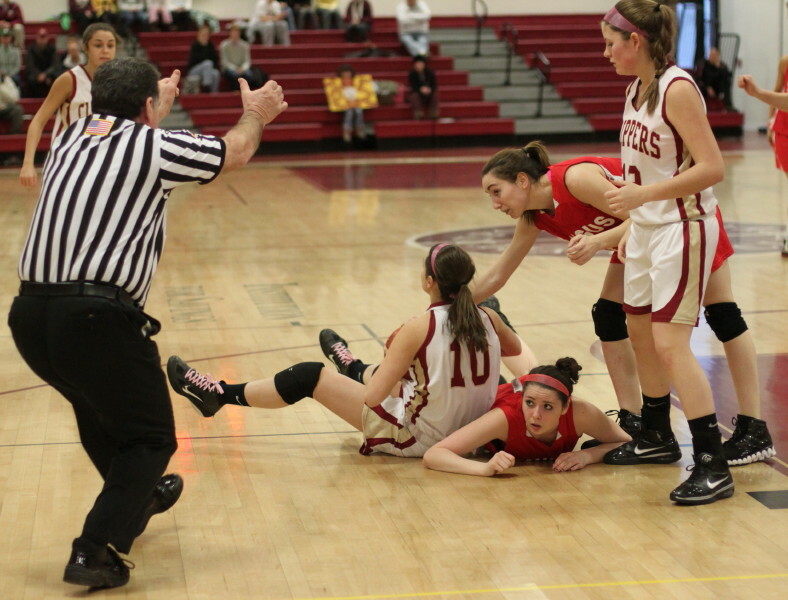 Beth Castantini picked up her third foul early in the second half and didn’t return until the 4th period. 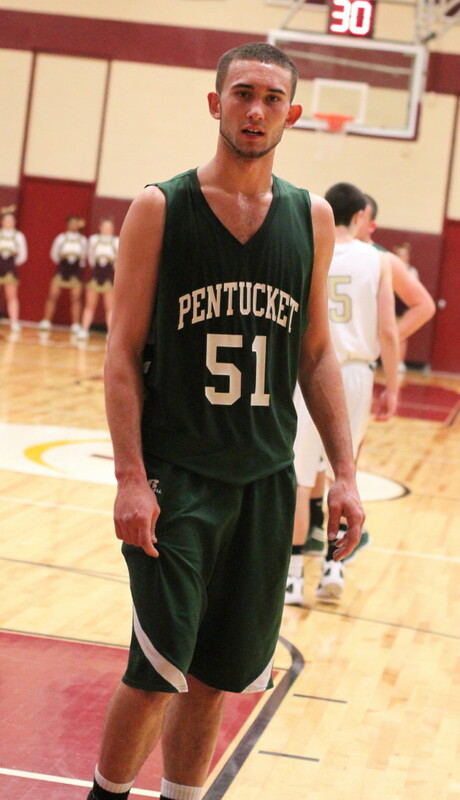 Pentucket coach John McNamara was in the house. 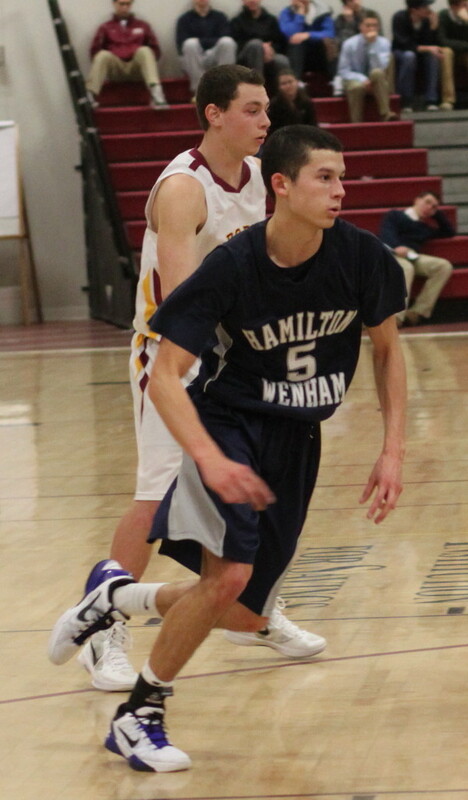 His team has defeated Newburyport twice this season.